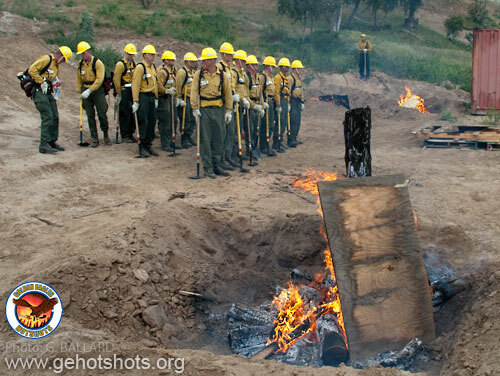 The SYCUANFIRE.COM and GEHOTSHOTS.ORG Web sites were expired in 2010  I am archiving my 2009 fire academy blog intact here for CHIEF MURPHY and participants. 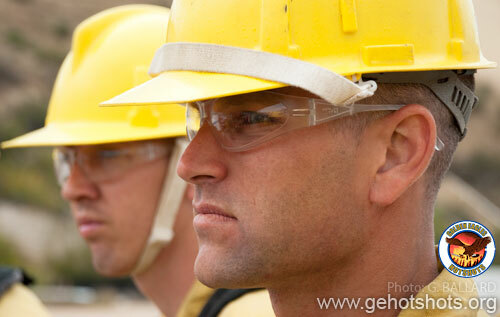 Allow A LOT OF EXTRA TIME for FAMOUS FIRE PHOTOGRAPHERS TOP 200 BEST FIRE PICTURES to load....this professional Web blog is typical of the 2006 2007 2008 2009 firefighter blogs I did for the fire department, but many of the links have been deleted on this archived copy. The academy was cancelled in 2010. 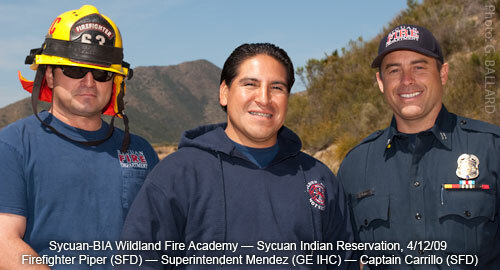 Sycuan's professional San Diego fire fighting training academy is held annually on the Sycuan Indian Reservation in Southern California  the 2010 fire academy was canceled. 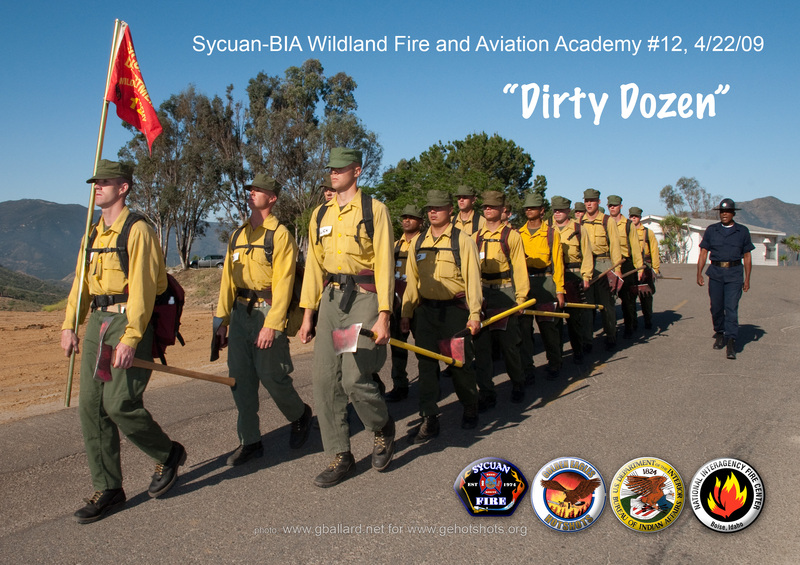 The "Dirty Dozen" (class #12) was successfully graduated from the tough Sycuan-BIA Wildland Fire and Aviation Academy in Southern California, San Diego County  DOWNLOAD 10-INCH FIREMEN'S SCRAPBOOK PHOTOS. 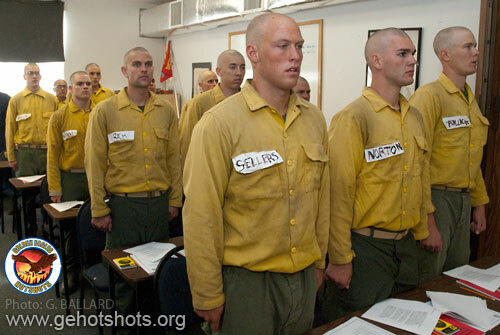 Thirty of the best recruits were selected from some 150 applicants  18 recruits successfully completed Sycuan's challenging Marine Corps style "boot camp" training academy and were certified "Fire Fighters" by stringent federal fire-fighting standards during formal graduation ceremonies on April 25, 2009. THE "DIRTY DOZEN"  BIA-Sycuan Fire and Aviation Academy #12 marches in formation, 0800 hours, April 22, 2009  all remaining 18 fire-fighting students pictured were graduated at Sycuan Resort, El Cajon, CA, three days after this professional photograph was taken  DOWNLOAD 10-INCH "BOOTCAMP" PIC. 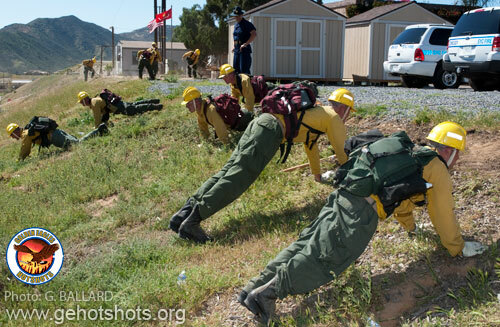 SPECIAL FORCES STYLE BOOT CAMP TRAINING  Elite wildland firefighters need super-human stamina and upper-body strength to fight raging fires in rugged wildness and back-country environments. 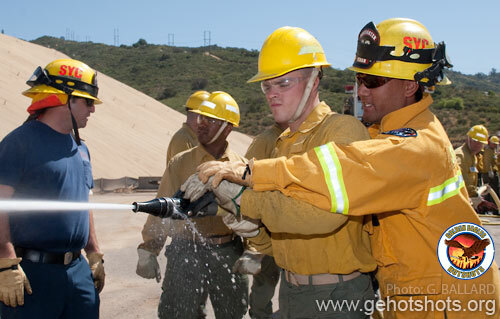 The Southern California, West Coast fire academy program at Sycuan is designed to create stressful situations and enforce strict Marine Corps style military standards of discipline and pressure its cadets into breaking their individual personal preconceived barriers of mental and physical limitations through teamwork and fierce group involvement of academy safety-training goals. 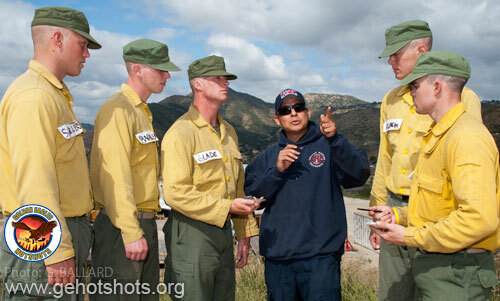 DI Castro (above), a former U.S. Marine, towers over the fire service's special forces fire trainees and barks out orders to the "nasties" to test their resolve, how badly each recruit wants to be a fire fighter. 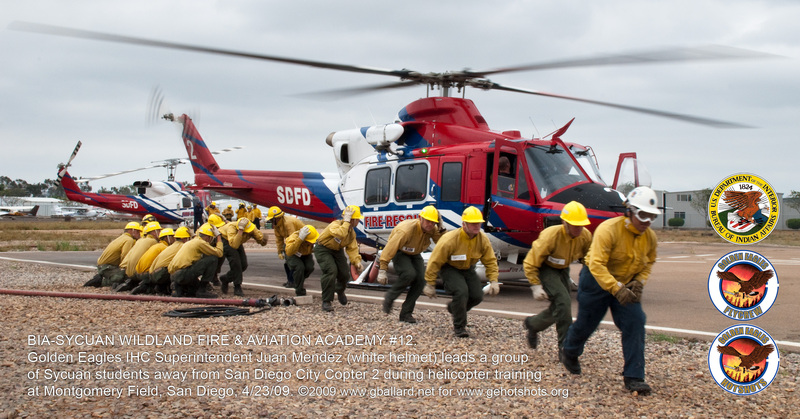 REAL-WORLD EXPERIENCE  Sycuan aviation academy students trained with San Diego City Copter 1 and San Diego City Copter 2 at Montgomery Field Helibase in San Diego  Supt. 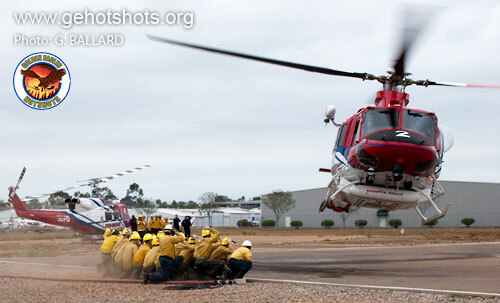 Mendez (GE IHC) leads a group of wildland fire students away from an idling fire helicopter, Day 19, April 23rd  DOWNLOAD 10-INCH HELICOPTER TRAINING POSTER. TOO CLOSE, Day 11  A sharp-eyed Sycuan instructor, Captain Warren Hopkins, spotted this large southern Pacific rattlesnake as a student was about to step beside it  during a hectic hose lay up a steep, badly eroded mountain trail. Wildland fire-fighting experts said they believe the rattlesnake had been lying dormant in a deep rut in the trail and the flood of hose water forced it to flee its hiding place for safety  luckily the day was a bit chilly and the highly-venomous snake wasn't nasty  it did not even shake and rattle its tail as a warning or strike at the fire fighters during the entire capture-release process. 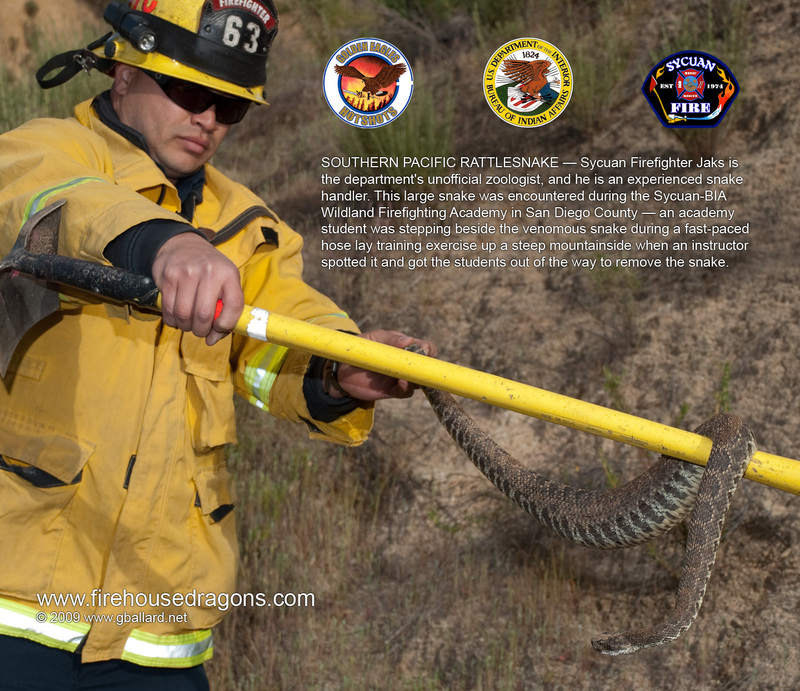 My still camera was halfway up the mountain so I only got the initial photo sequence on video, but here is a sharp, high-resolution BIA safety-training poster of firefighter holding the giant rattlesnake: DOWNLOAD HIGH-RESOLUTION RATTLESNAKE PHOTO. Sycuan staff Firefighter Jaks was able to capture the dangerous snake, release it unharmed away from the training area and the academy resumed wildland fire training on the rural San Diego mountain. NIGHT OPS  Here's where I found the fire academy on April 14th at 0400 hours  hunkered down atop MF Mountain after cutting line all night. 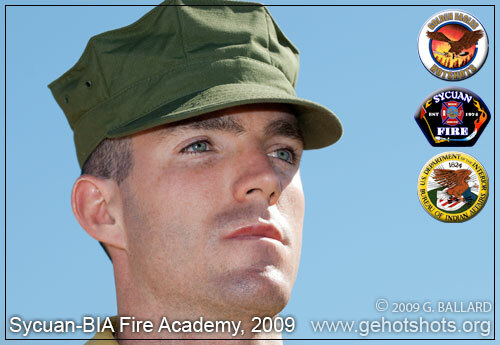 DOWNLOAD HIGH-RESOLUTION BIA POSTER for more information about this awesome professional fire-fighting picture. This is an amazing 120-second camera exposure taken in the dead of night. 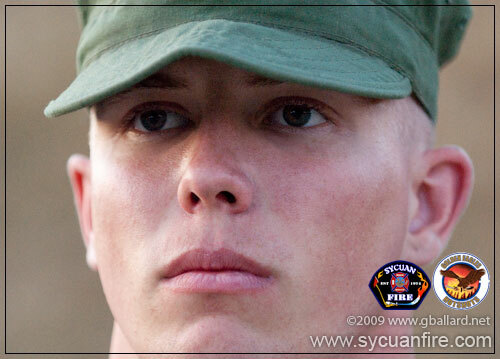 RECRUIT HEAGNEY is a 26-year-old Marine Corps combat veteran who served in Iraq during Operation Iraqi Freedom 2005 OIF 2005. 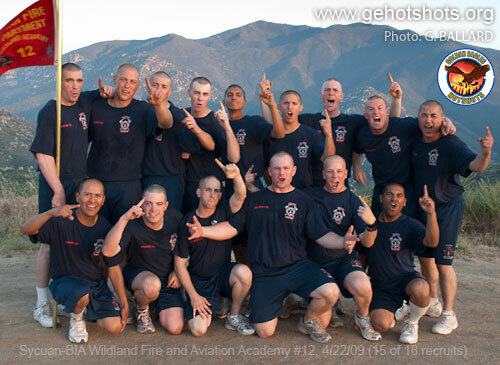 DIRTIEST FACE  Heagney and his fellow recruits had just wrapped up 36 continuous hours of extremely demanding Night Operations (Coyote Tactics) cutting fire lines on the Sycuan mountains  all 19 remaining students who began the operation successfully finished it  above photo taken April 15th, 0630 hours. 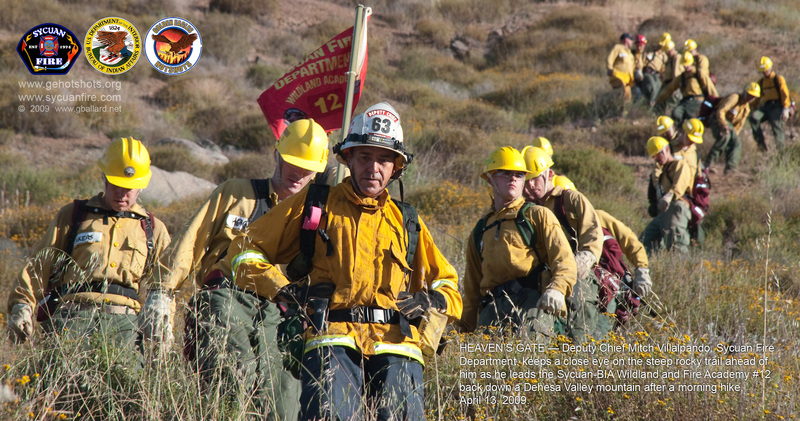 MORNING HIKE  Deputy Chief Villalpando leads the SYCFD fire academy trainees down off a steep Dehesa Valley mountain  DOWNLOAD HIGH RESOLUTION BIA POSTER. 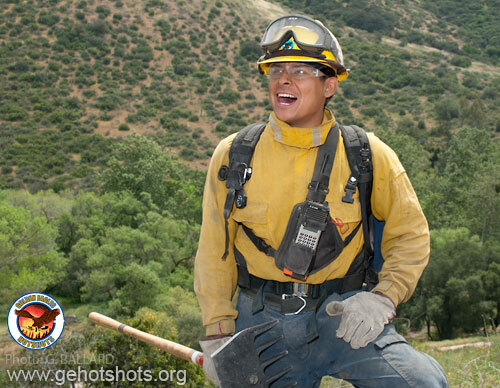 APACHE  The Sycuan Tribal Fire Department and the BIA (Bureau of Indian Affairs) aviation and wildland fire programs encourage physically fit young Native American men and women to apply for exciting career opportunities within the professional fire service. 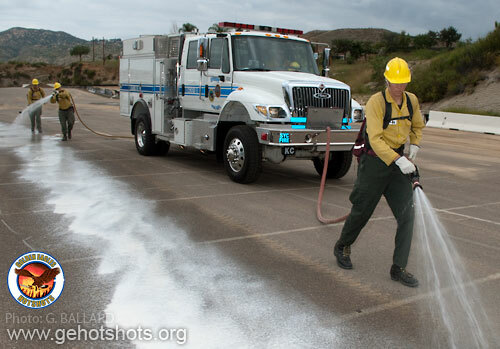 NATIVE AMERICAN INDIAN: Recruit Armstrong (Fort Apache-White Mountain Indian Reservation) sprays a fog stream during his turn at nozzle man during a mobile pumping exercise utilizing Sycuan's state-of-the-art Type 3 fire engine and a light weight Wajax® hose used in modern wildland fire suppression. 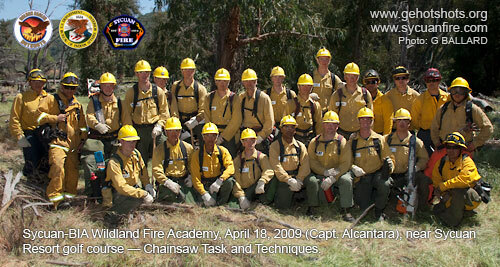 INDIAN PREFERENCE: First preference in filling training and employment openings with Sycuan Fire Dept. will be awarded to qualified Native American Indian candidates in accordance with the Indian Act of 1934 (Title 25, USC, Section 472). Verification Form BIA-4432 must be submitted with any employment or training application if applicant is claiming Indian Preference. 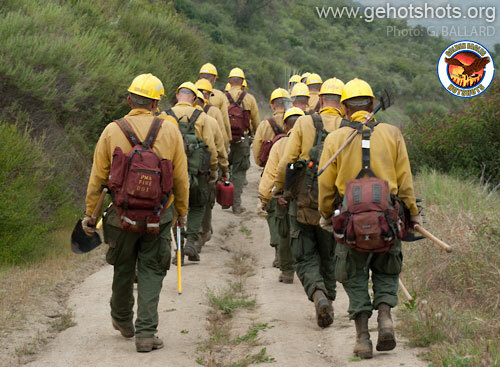 TEAMWORK  A squad of fire fighter recruits walk a freshly-cut fire line on the Sycuan reservation during Day Four of the Bureau of Indian Affairs Wildland Fire Academy. 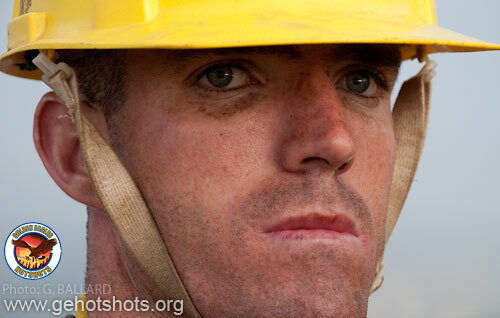 "I want the best  only the best can be fire fighters at Sycuan." 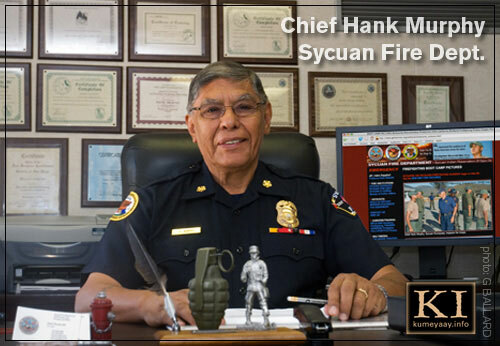 WELCOME  Sycuan Fire Chief Hank Murphy (Kumeyaay) founded the Sycuan Fire Department SYCFD in 1974 and has served on the Sycuan tribal council for more than 30 years. 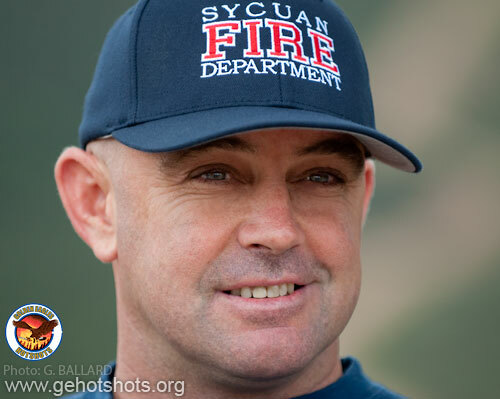 Chief Murphy currently heads the Sycuan Tribal Fire Department, including its elite BIA Golden Eagles Hotshots IHC air and wildland fire-fighting divisions. 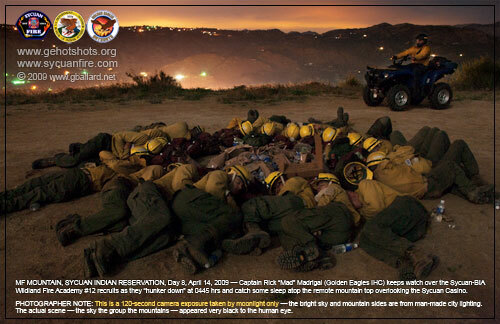 DOWNLOAD HIGH-RESOLUTION POSTER Sycuan Golden Eagles Air & Wildland Division 2008 fire season pictures  Golden Eagles represent the "special forces" of modern firefighting. 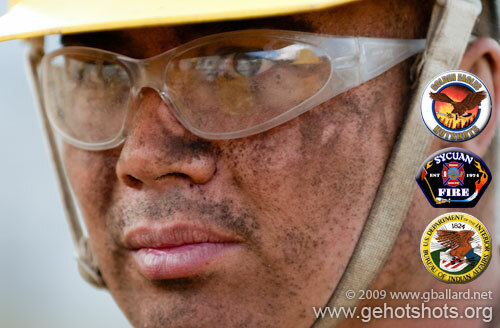 Visit the SYCUAN HUMAN RESOURCES On-Line Career Center for job searches, employment listings. 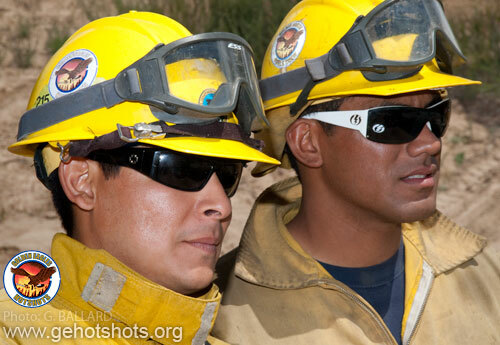 Sycuan employs more than 2,500 people in a variety of positions, including casino operations, food service, security, accounting, facilities, professional golf academy, landscaping and fire fighting professions The Bureau of Indian Affairs BIA maintains some 90 HOTSHOT CREWS across the USA. To provide FEEDBACK or comments about the Sycuan Academy program, please CONTACT THE CHIEF through the ADMIN email. 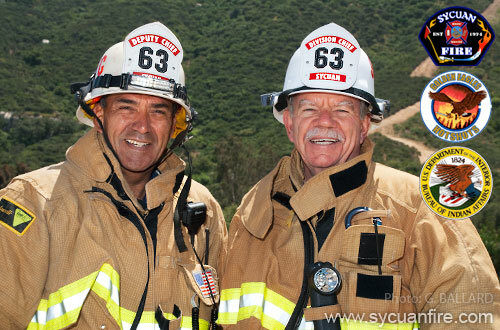 Sycuan Fire Deputy Chief Mitch Villalpando and Sycuan Fire Division Chief William "Bill" Clayton  pictured Day 12 during a CERT training exercise  Chief Clayton has more than 50 years in the fire service. 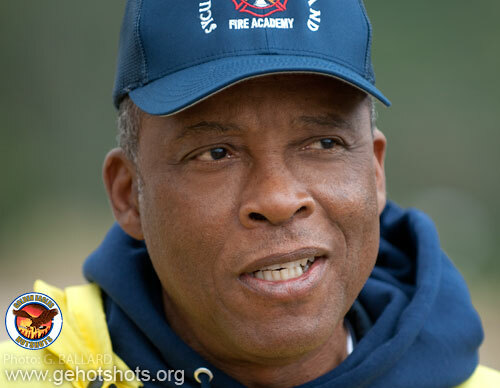 Chief Clayton's 50 years of professional fire-fighting experience and knowledge are real assets to the department and he serves as a role model and mentor to even the most experienced professional fire fighters  Chief Clayton is a legend in his own time by any standard of professionalism. 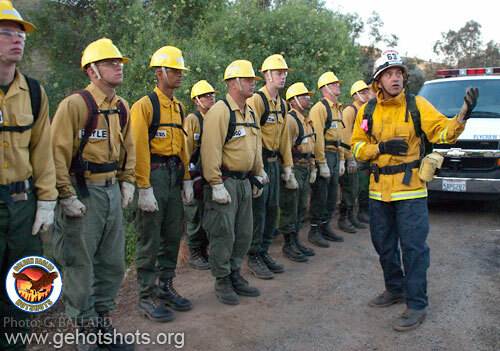 Battalion Chief Wadell Kanseah (Mescalero-Apache), Sycuan Fire Department Wildland Division  pictured Day Two addressing recruits at the Sycuan Training Center. 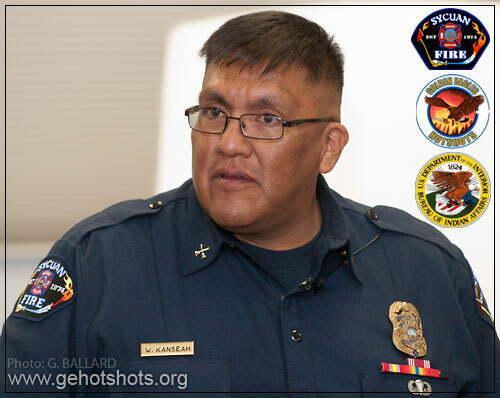 Chief Kanseah brings a wealth of professional wildland fire experience and strong leadership to the Sycuan team, including extensive experience working with the Bureau of Indian Affairs (BIA) and other tribal fire departments. 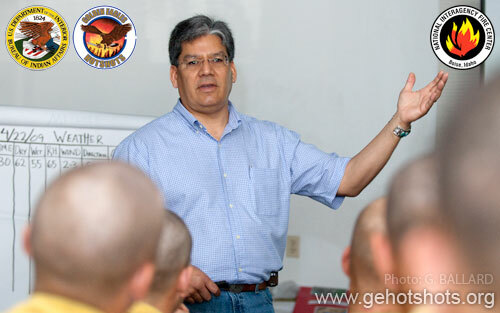 Superintendent Juan Mendez (Zapoteca), 33, is the superintendent of the BIA Golden Eagles Interagency Hotshot Crew IHC at Sycuan  pictured Day Nine briefing the recruits and academy instructors at the start of Coyote Tactics. 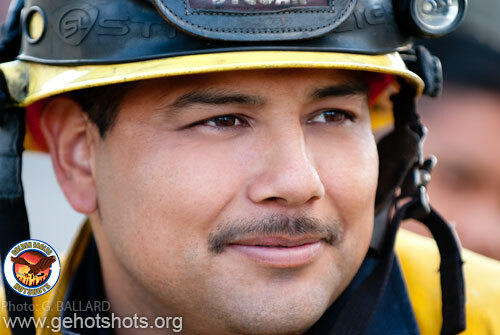 Mendez began his fire career in 1994 as a volunteer fireman with the Pala Tribal Fire Department. In 1995, Mendez completed the 1995 Sycuan Fire Academy (DOWNLOAD HI-RESOLUTION SCHOOL PHOTO) and was immediately hired on to the Sycuan Fire Department. 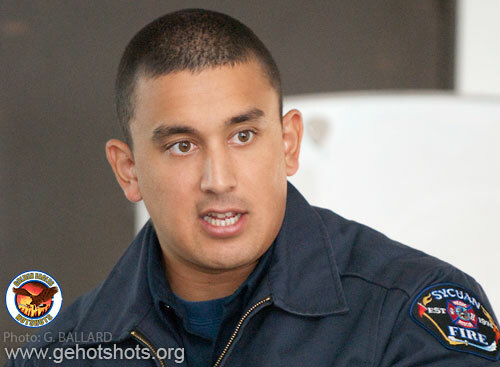 Juan ("Huge" is his firefighter's nickname on the crew) quickly worked his way up through the ranks to his current position  crew superintendent. 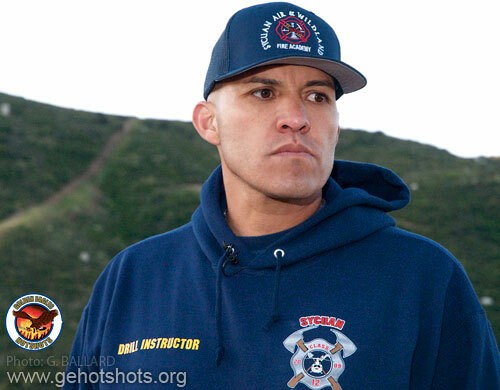 Mendez has been employed by the Sycuan Fire Department as one of its top professional firefighters for 14 years now (since 1995). 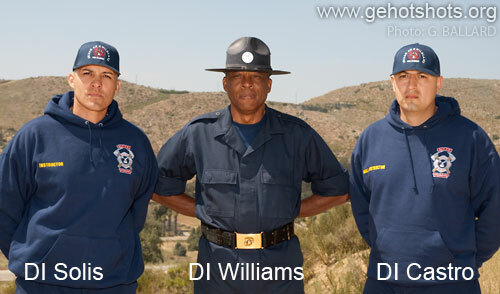 Drill Instructor Solis, Williams and Castro (all former Marines). 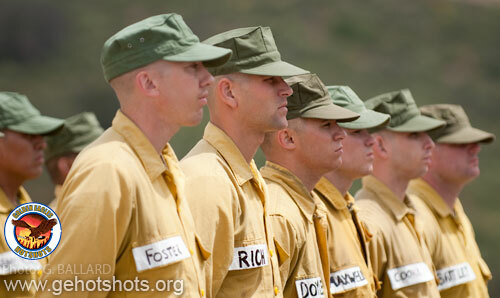 The fourth Sycuan drill instructor, DI Bowen, is not pictured here  photographed Day Three. 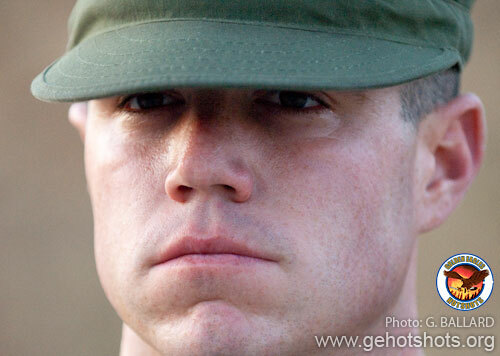 Drill Instructor Williams is a highly-experienced U.S. Marine Drill Instructor who lead 15 platoons in Marine Corps boot camp during his military career. 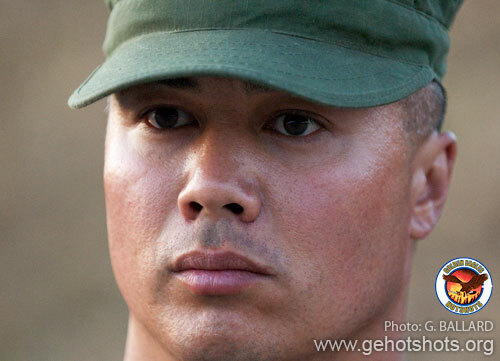 Solis and Castro are the team's "pit bulls" (as the recruits will attest) and they provide the backbone of the Marine Corps-style bootcamp discipline. 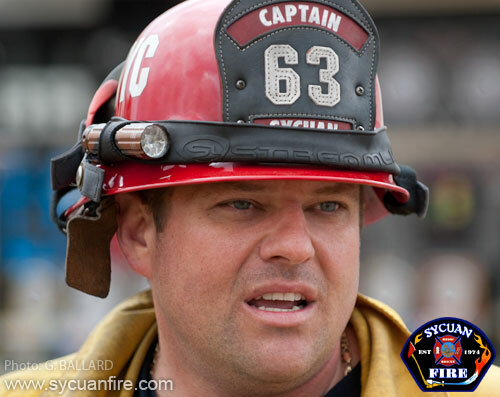 Drill Instructor Terry Bowen is a Sycuan professional firefighter. Bowen trained with special forces units and served in Desert Storm during his three-year U.S. Army active duty enlistment. 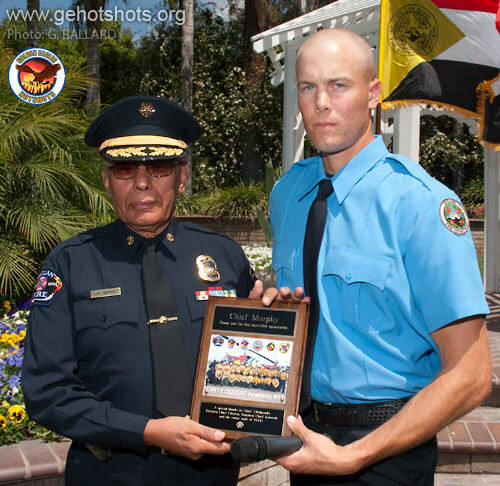 He also served seven additional years with the National Guard Reserve and participated in the Northridge Earthquake and the L.A. riots as a federal guard member. Elite Golden Eagles Interagency Hotshot Crew (IHC) also do a lot of the PT and field instructing during the academy (pictured here at sunset, Day Nine). BIA-NIFC Regional Aviation Manager Dave Underwood, a famous federal training officer in the fire community and highly-experienced helitack instructor, Dave Underwood conducts many of the helicopter flight and aviation safety training courses at the BIA helicopter academy at the San Diego County aviation training facility  his official govermnent Web sites are BUREAU OF INDIAN AFFAIRS (BIA) and NATIONAL INTERAGENCY FIRE CENTER (NIFC). Hank Wayne (Radio / Communications). 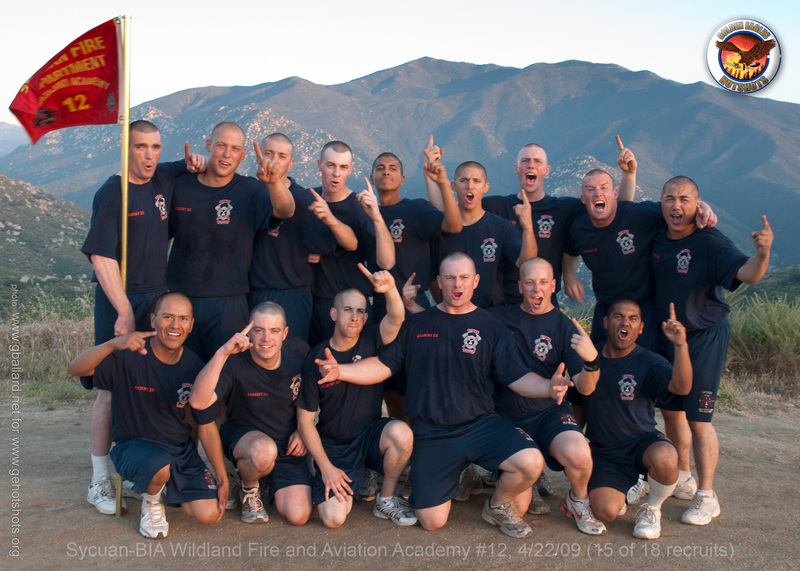 The BIA-Sycuan firefighting academy program is a tough 21-day Marine Corps style “boot camp” school for professional entry-level firefighter certifications and job placement within the federal, tribal, state and local fire services. 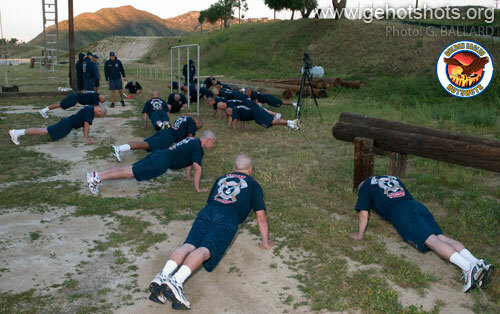 Former Marine Corps DI (professional drill instructors) take charge of 30 individual civilian "nasties," weed out the best of the best, and transform them into a team of gung-ho can-do fire fighters. 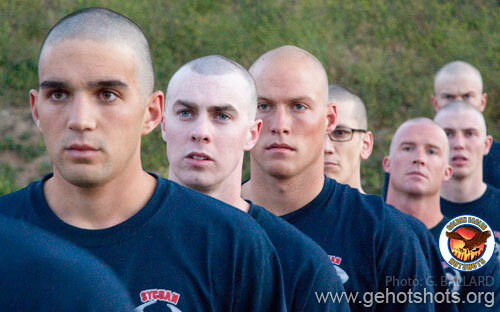 From check in to graduation  the Sycuan fire school experience is physically and mentally demanding to even the strongest recruits because the team is only as strong as its weakest member. 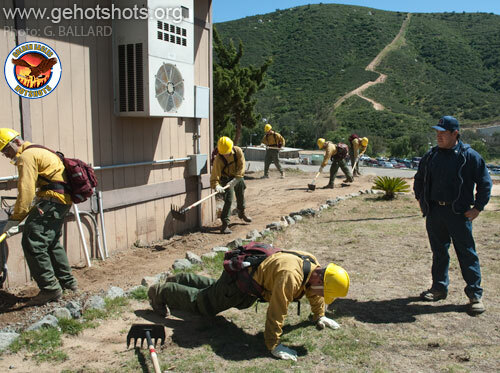 The Sycuan-BIA program uses a steep 800-foot California mountain as a metaphor to overcome and conquer pre-conceived notions of individual limitations through teamwork, camaraderie and fierce group participation of achieving team goals. 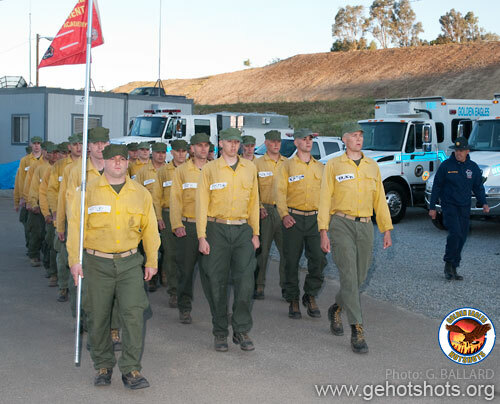 Strict enforcement of rules, adherence to academy protocol, and military standards of discipline and teamwork set the Sycuan fire academy training apart from weaker fire-fighter programs. 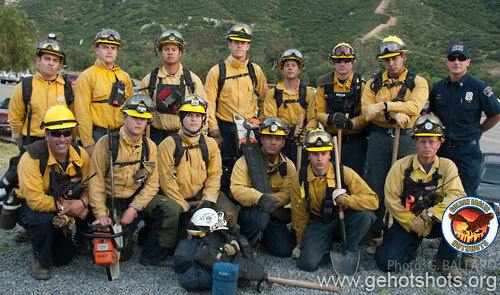 Successful completion of the Sycuan fire program qualifies graduates for many professional employment opportunities, including full-time and seasonal jobs with the Sycuan Tribal Fire Department (SYFD), the California Department of Forestry and Fire Protection (CAL FIRE), and jobs within the federal forest fire service, including top government agencies like the United States Forest Service (USFS) and the Bureau of Indian Affairs (BIA) hotshot crews working nation wide. 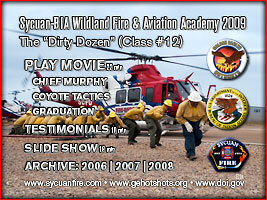 Please CONTACT THE SYCUAN FIRE DEPT www.sycuanfire.com for more information about applying to the best fire-fighting academy program in the world. 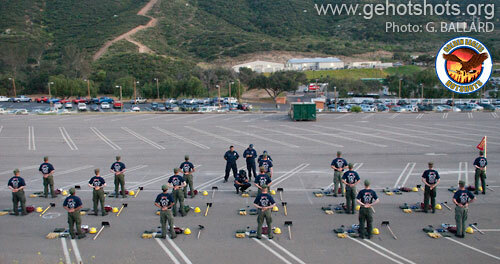 Fire academy recruits were kept busy as their group formed. 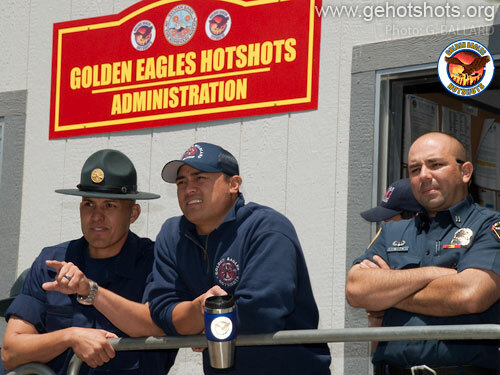 Superintendent Juan Mendez, Golden Eagles Interagency Hotshot Crew (IHC), was on hand during check in and kept the trainees on their toes (and pumping them out). 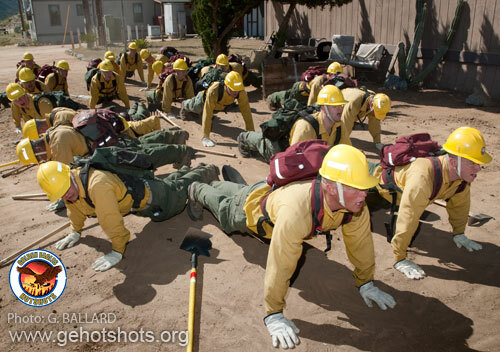 Elite wildland firefighters need upper-body strength and super-human stamina  the academy program is designed to instill strict discipline and show the cadets how to break individual preconceived barriers of mental and physical limitations through teamwork and group support system of brotherhood and family. 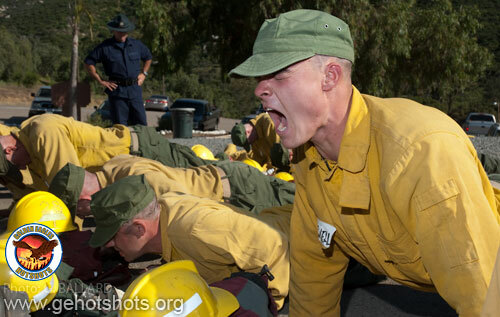 A cadet gets a first-hand taste of tough Sycuan fire training standards. Sycuan Fire Department Deputy Chief Mitch Villalpando addressed the recruits and welcomed them to the Sycuan-BIA academy. 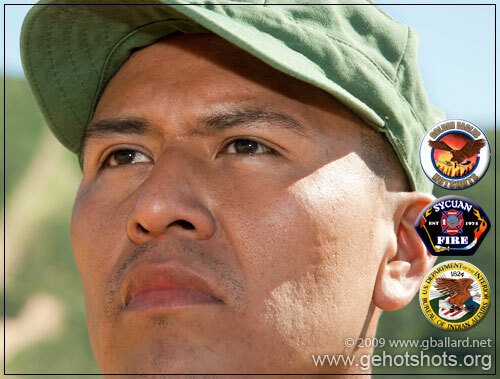 American Indian Recruit Armstrong (Fort Apache, White Mountain Indian Reservation). 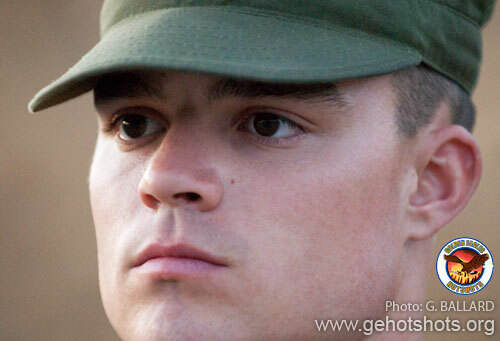 Recruit Sellers, 18, the youngest cadet in the academy. 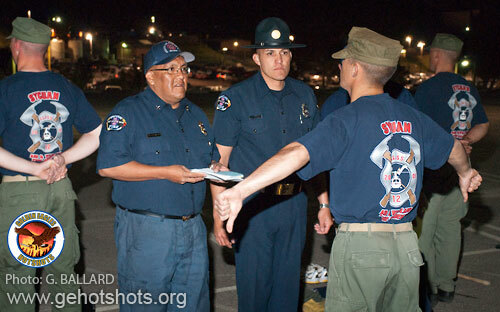 Recruit Salazar, Downey, CA. (Karina and your family say hello and they are very proud of you!). This is where I left the recruits today (5:30pm) marching to chow...surprisingly, everyone looks in step on their first march as a group. 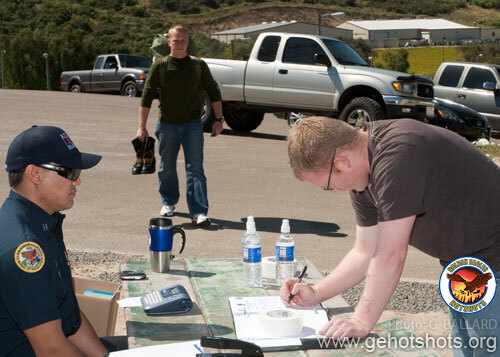 Note: Wildland Base Camp is pictured in the background. Reveille was 0500 hours, this photo series on the Sycuan obstacle course starts out at first light after the recruits morning run on the reservation. 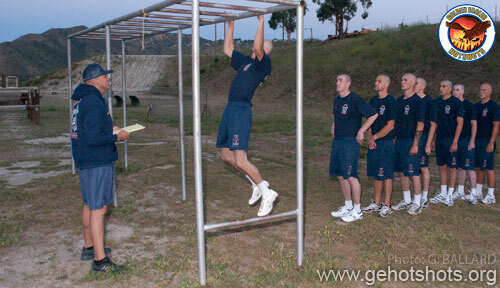 The academy is designed to closely monitor each recruit's progress during the demanding three-week program  here, DI Solis is noting the number of chin ups each cadet is able to do on Day Two. 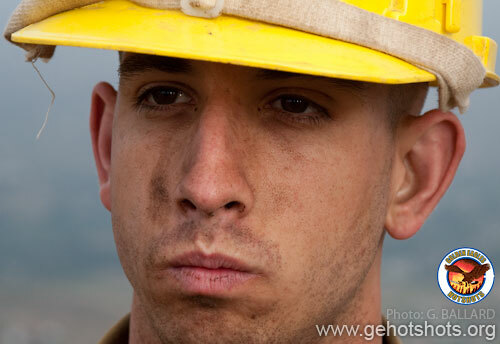 Drill Instructor Solis is a Sycuan firefighter and former U.S. Marine  pictured Day Two before sunrise. 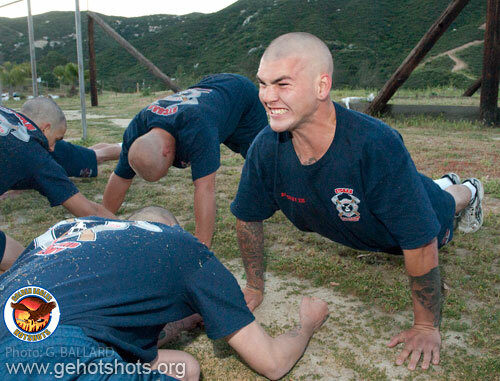 Here DI Solis has his game face on for the recruits as he leads them during a hard workout on the Sycuan obstacle course. The sun was just hitting the mountain tops the when the group finished and changed for breakfast in the Sycuan Casino. Changed into fresh uniforms, the students head off to chow. 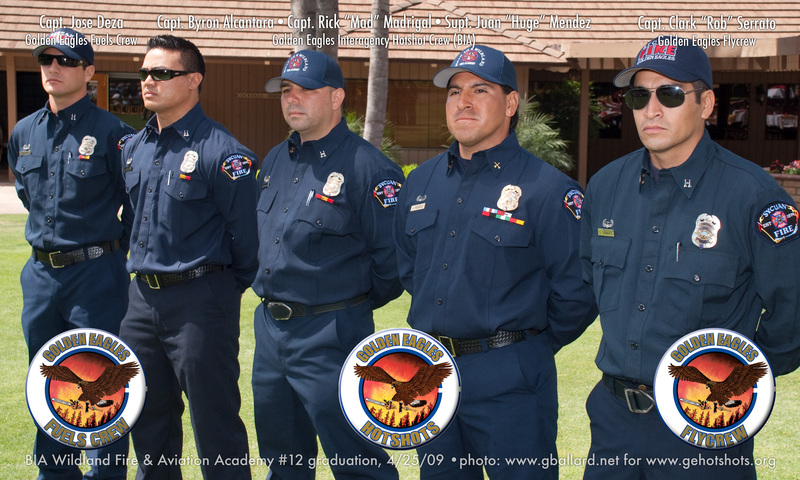 The recruits arrived at the Kumeyaay Community College classroom and were introduced to the Sycuan-BIA academy staff, including Chief Murphy who officially welcomed them to the Sycuan Fire Department. Sycuan Division Chief William Clayton shares his 50 years professional experience in the fire service with the students to pass on his life-saving knowledge and experience to the young trainees. The cadets got a "working" chow in the classroom and were presented with PowerPoint presentations about the OSHA Standard for Emergency Heat Illness. 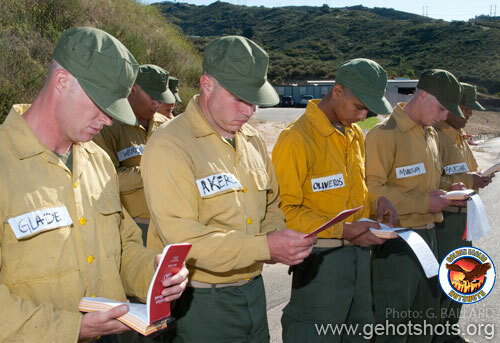 Students have a lot of "knowledge" to absorb during the Sycuan fire academy and are taught to spend every free moment studying. 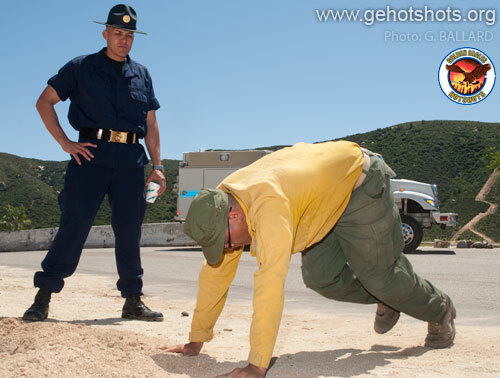 DI Solis gives special attention to a recruit  mountain climbers. After morning PT and breakfast, Day Three was spent mostly in the classroom. Above, Sycuan Golden Eagles Hotshot Goodwin led a training discussion about the S-130. 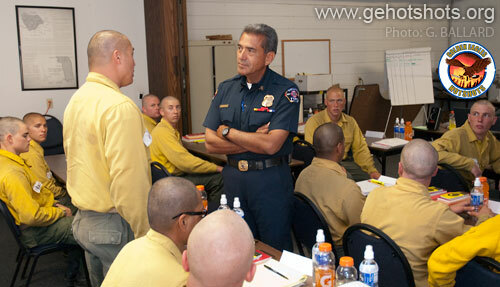 Sycuan Firefighter Menchaka made a point to the cadets during one of his presentations. 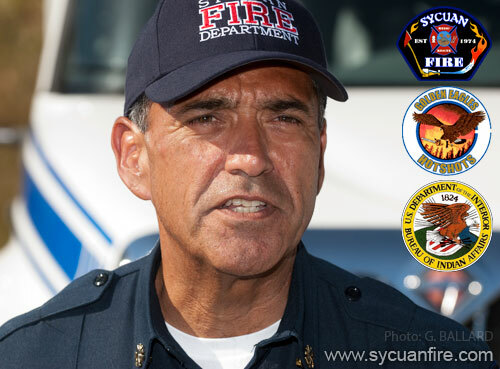 LEADERSHIP  Sycuan Fire Department Deputy Chief Mitch Villalpando held a special meeting with the recruits and personally asked each recruit to give him and and fellow recruits a brief history and why they are joining the fire service. 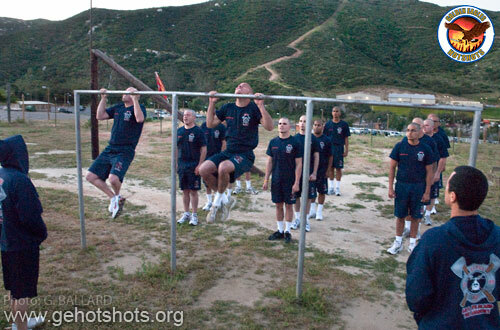 The fierce competition for the limited slots available in the academy gave the department best, highest-motivated recruits in the United States of America to choose from. 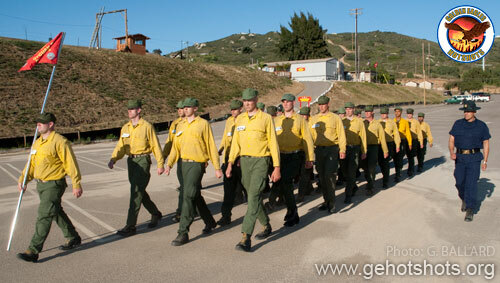 Firefighter recruit Oliveros, 18, of Apple Valley, California, was pictured on Day Three in formation with his fellow firefighter recruits. DRESS RIGHT  DI Williams is a highly-experienced U.S. Marine Drill Instructor who lead 15 platoons in Marine Corps boot camp during his military career  pictured Day Three. 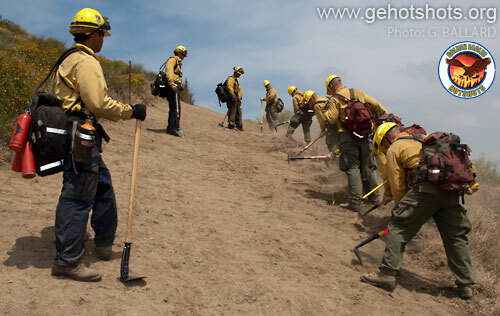 Firefighter recruits walk a fire line on the reservation during Day Four of the Bureau of Indian Affairs Wildland Fire Academy at the Sycuan Training Center in San Diego County. DI Castro towers over the recruits as he whips them into special forces style mental and physical conditioning. 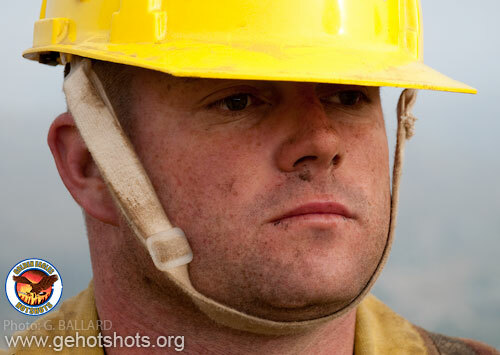 The Sycuan Hotshots posted experienced wildland lookouts and set four large pit fires as a training aid for today's field classes  the smoke permeated the surrounding back country by strong winds and set an uneasy tone in the community for the realistic fire fighting training. 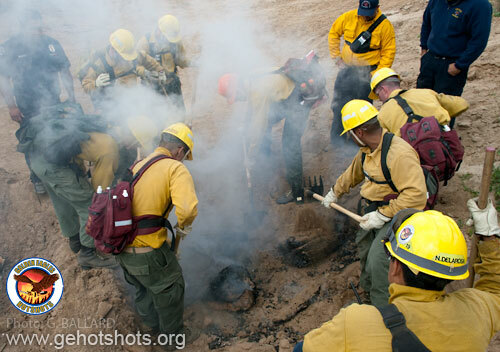 The fire students attacked the fires with hand tools and portable water spray devices under very close supervision  these were very HOT fires. The cadets eventually got the fires under control and performed mopping up operations as part of their fire-fighting curriculum. 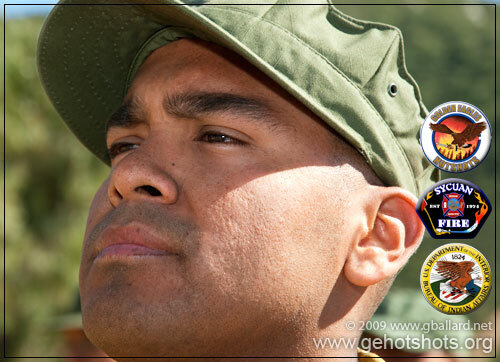 The operation took place near the GEHS Base Camp on the beautiful Sycuan Indian Reservation in Southern California. 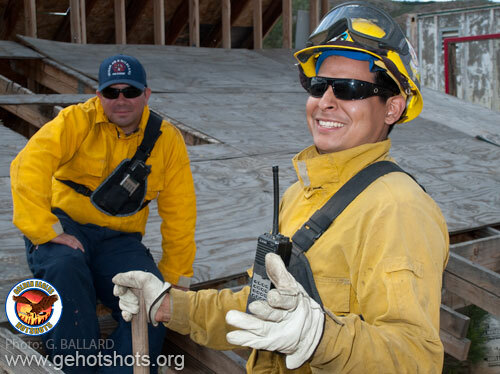 Experienced Golden Eagles Hotshots observed and took part in today's fire training  pictured are firefighters Delarosa and Faumuina (both 2008 academy graduates). 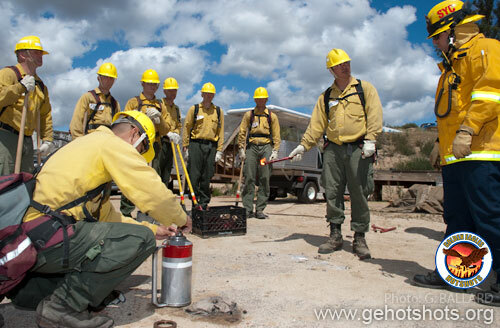 The recruits also learned about using safety flares and drip torches. Firefighter Delarosa told a funny story to his fellow firemen while the students participated in the event. 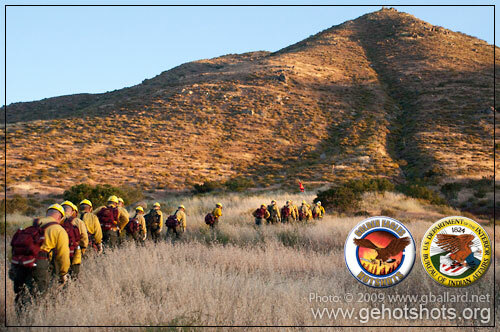 The Hotshots spend a lot of time together and many become like brothers to each other. The academy students also cut line with their hand tools, Sycuan GEHS Firefighter Sawboss is pictured looking down on the recruits. 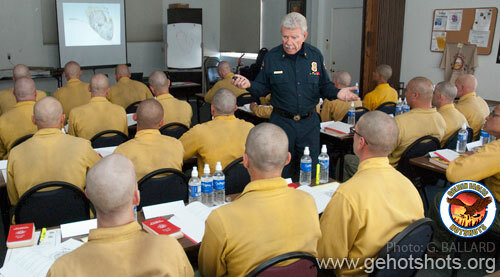 Instructor Sawboss talks to his students during training. 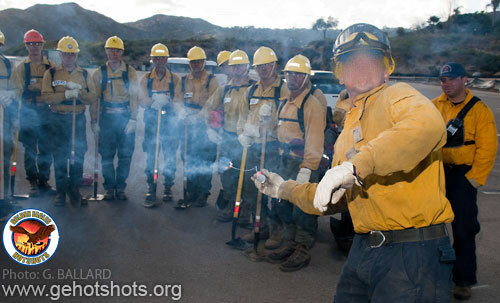 An experienced Golden Eagles wildland fireman shoots an incendiary bullet in the Sycuan parking lot to demonstrate the firepower to his students. A hotshot hurled a lighted incendiary grenade in the parking lot to demonstrate how the devices explode to the students. BIA fire recruits started classes at 0800 hours with a Maps and Compass lecture with Chief Clayton and Superintendent Mendez. Supt. 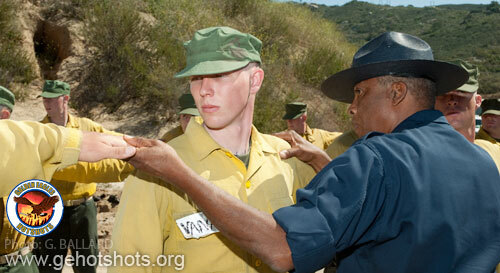 Mendez (Zapoteca) helped some recruits to understand topographical map reading. 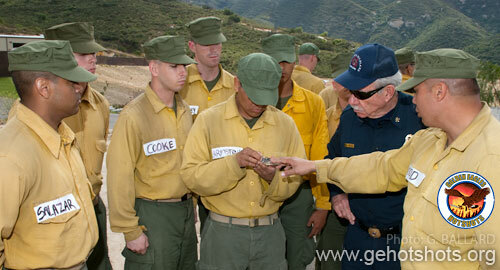 Outside, the academy split into three groups and got hands-on experience using a firemen's compass. 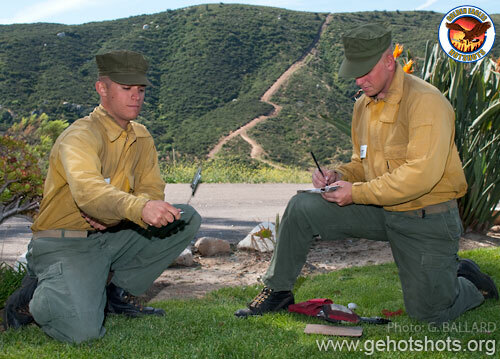 Bureau of Indian Affairs fire academy students get familiar with a compass during class  Recruit Armstrong (Apache, White Mountain) is pictured reading the compass. A seasoned Sycuan hotshot helped students with their compass assignments. 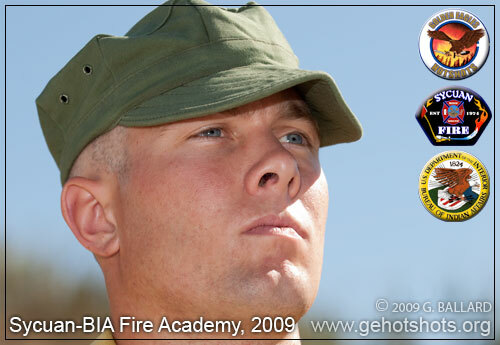 21 BIA FIRE ACADEMY RECRUITS, Day 5  DOWNLOAD HIGH RESOLUTION PHOTOGRAPH FOR PRINTING. 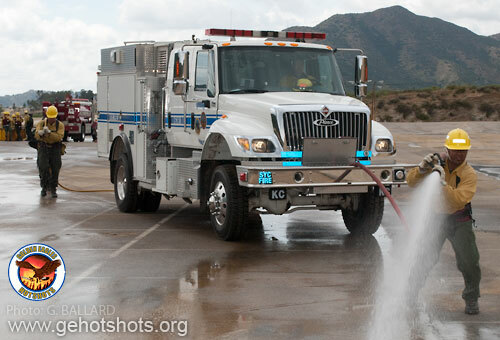 MOBILE ATTACK  BIA wildland firefighter students are taught mobile attack procedures at the San Diego fire academy and are pictured on the Sycuan Indian Reservation using a state-of-the-art Sycuan water tender. 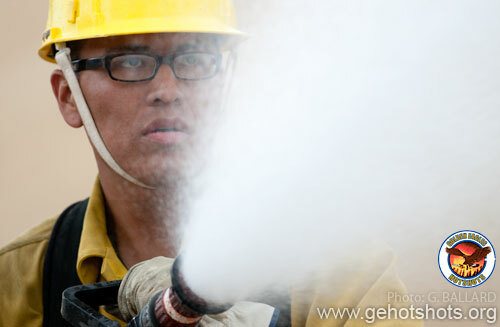 APACHE INDIAN  Recruit Armstrong, from White Mountain Indian Reservation, sprays a fog stream as the nozzle man during mobile pumping exercises at the Sycuan Training Center. 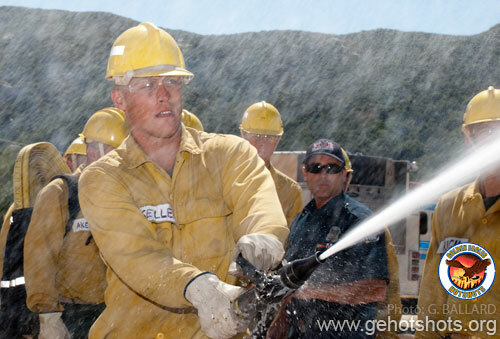 Native American firefighter Recruit Armstrong (Apache, White Mountain) is pictured spraying water from a high-pressure fire hose. 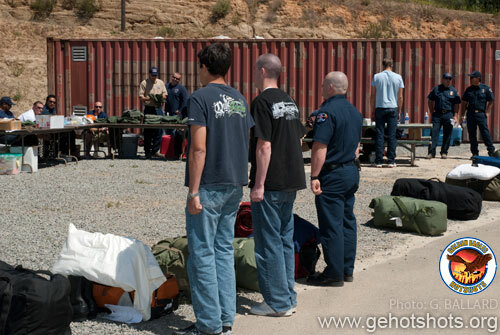 FIRE SHELTERS  San Diego County fire academy students practice a basic wildland life-saving technique where they are told to quickly shed their fire-fighting gear and escape to a pre-determined safety area to deploy their fire shelters. 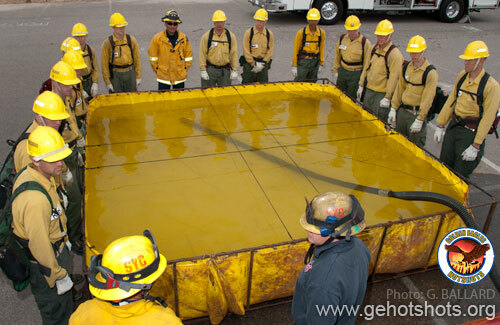 The Sycuan students learned about various pumps during today's field classes, including the porta-tank. 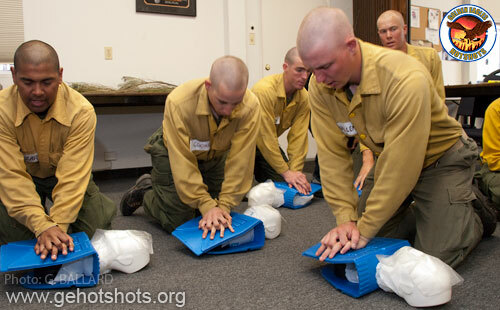 The cadets paid close attention during the safety-training field lectures. 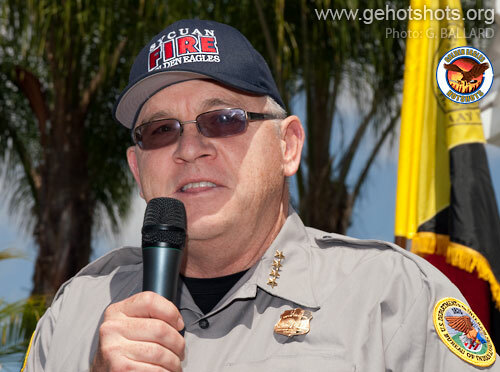 CAPTAIN WARREN HOPKINS, Sycuan Fire Department  The Sycuan Fire Department is a large, well-financed tribal fire department who employs a large full-time and seasonal staff of professional firefighters, including inter-department training activities, to serve the rural San Diego east county communities with improved quality of life. 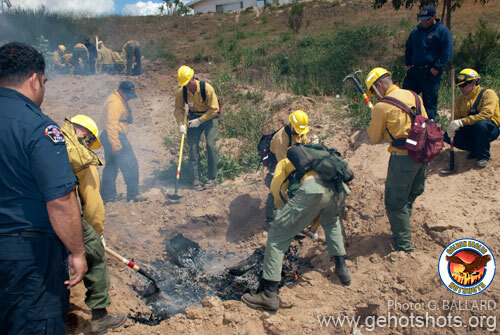 PRACTICE MAKE PERFECT  BIA academy firemen trainees each got an opportunity to perform various fire-related jobs. DI Issac Williams kept a close eye on the recruits. 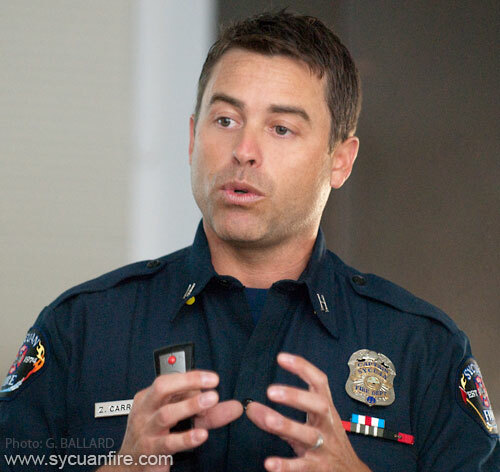 Captain Zach Carrillo, Sycuan Fire Department Training Coordinator “C” Shift, gave several of his famous professional PowerPoint® training presentations to the San Diego fire academy students. 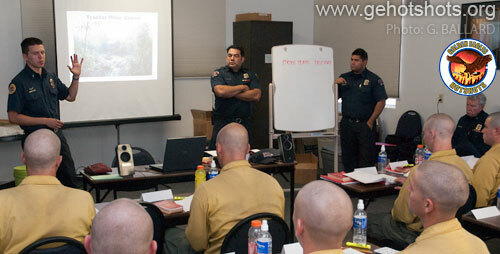 Sycuan Firefighter Marco assisted Captain Carrillo during the training lectures. 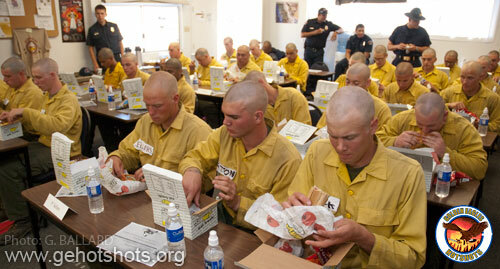 Another recruit dropped because of an injury  20 Sycuan recruits remain in the tough academy  photographed here just before lunch. 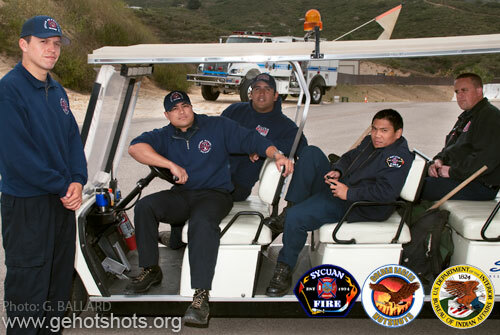 Sycuan firemen took seats on one of the Sycuan carts during lunch break. 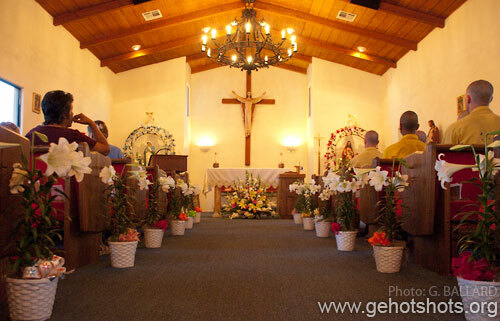 EASTER SERVICES  Fourteen of the remaining 20 student firefighters attended Easter services in the Sycuan reservation church. 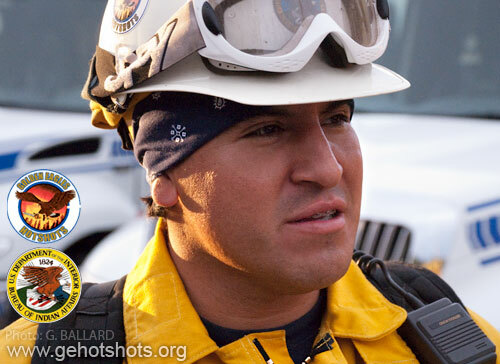 Golden Eagles Interagency Hotshot Crew Superintendent Juan Mendez (center), took a crew scrapbook picture with Sycuan Fire Department Captain Zach Carrillo (right) and Sycuan Firefighter Piper. DOWNLOAD a huge full-resolution photo. Capt. 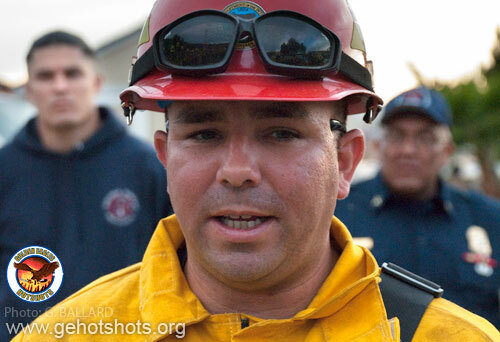 Carrillo, Sycuan Fire Department, stepped in during a pause and gave a group of fire students additional information about the hose-laying operation and proper fire-fighting technique. 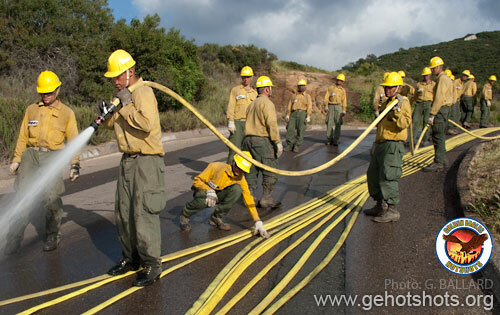 San Diego California wildland fire academy instructor Fireman Takahashi helped a young fire recruit learn how to properly hold a streaming high-pressure fire hose. 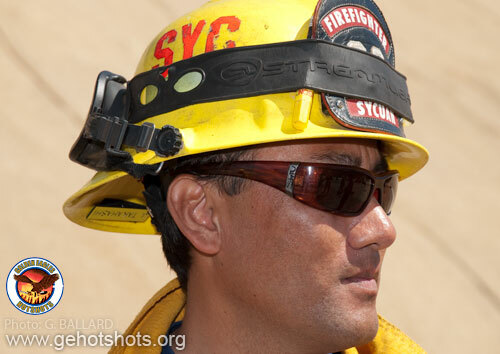 SYFD Firefighter Takahashi was one of the professional instructors who taught today's classes at the elite San Diego wildland firefighting academy. 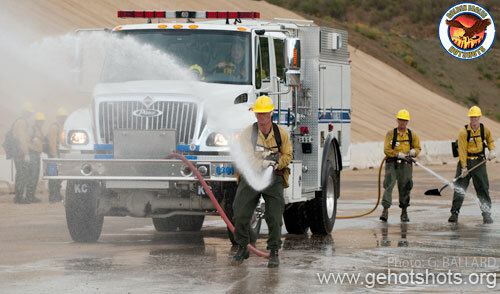 Each recruit got a chance to use a high-pressure fire hose. 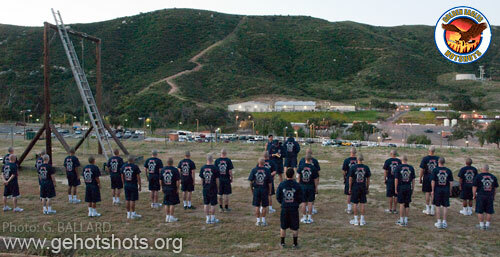 DI Bowen gets the recruits ready and in formation for a planned early-morning hike. The academy wildland students meet up on scene with Chief Villalpando and he introduces them to "his" mountain, Heaven's Gate. The academy heads off up the Dehesa mountain...the group crossed over the peak and onto a higher mountain top. 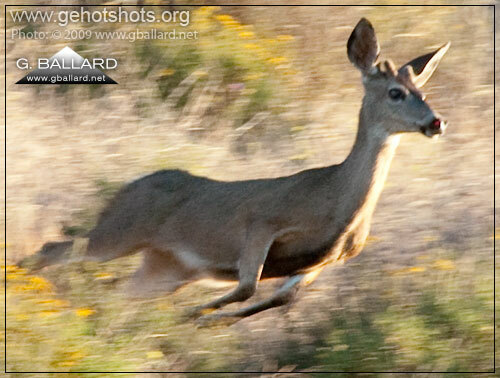 This wild California deer bolted by the webmaster on this hike  to get these kinds of nature shots it helps to be fast on the draw and have a steady hand to pan with the fast movement all the while keeping the animal in focus and properly exposed. View from partway up the mountain looking back towards the Sycuan Indian Reservation  HIGHER REZ. 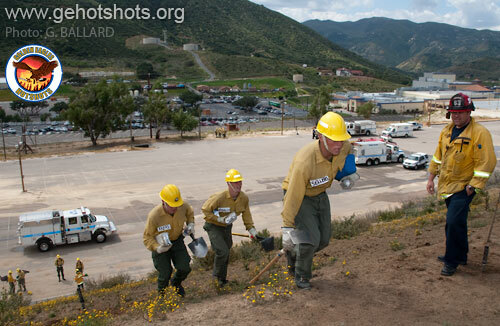 Deputy Chief Villalpando leads the academy down off a Dehesa Valley mountain side  DOWNLOAD HIGH RESOLUTION BIA POSTER. 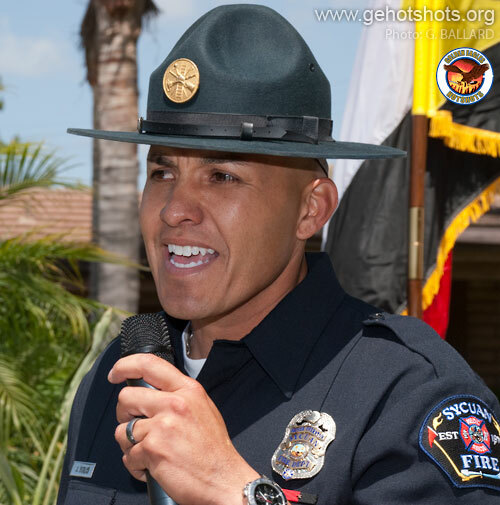 BIA Superintendent Juan "Huge" Mendez (Zapoteca)  33-year old superintendent of the Sycuan Golden Eagles Interagency Hotshot Crew IHC  briefs the recruits and academy instructors at the start of Coyote Tactics. 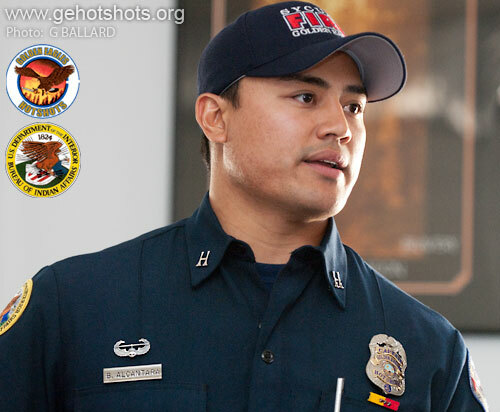 GE IHC Captain Rick "Mad" Madrigal went over the plan with firefighters and recruits. 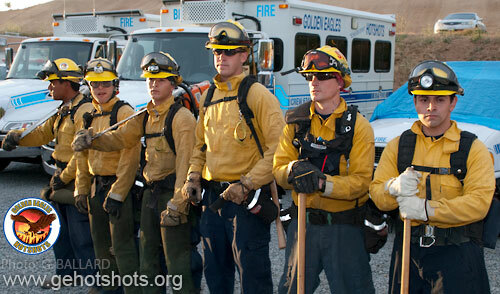 Golden Eagles Hotshots crew members stood by for the briefings (wildland crew buggies in background). 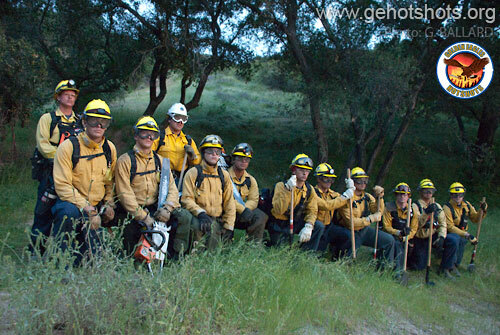 Experienced California wildland hotshots posed for a firemen's scrapbook picture. 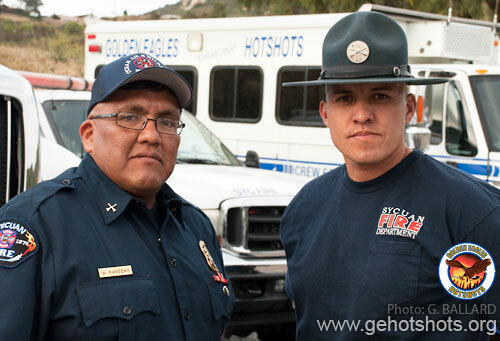 Battalion Chief Kanseah (Mescalero-Apache) and DI Solis were on hand to observe training. 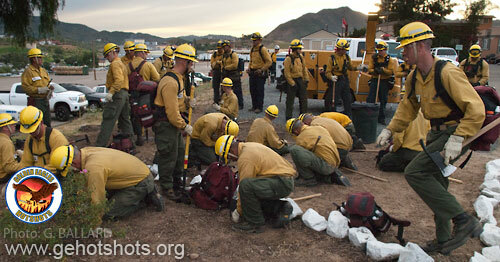 The fire fighters and fire trainees mingled and made last-minute preparations before heading out to MF Mountain. 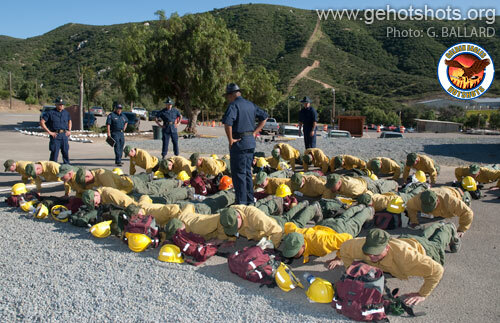 Recruits receive additional instructions at scene (at the foot of Mount MF). 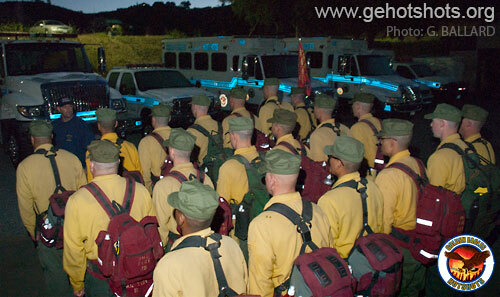 Elite Golden Eagles Interagency Hotshot Crew (IHC) pictured during final briefing. 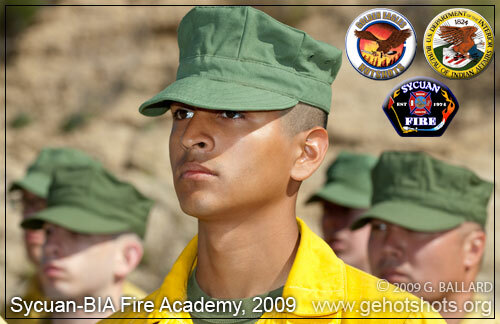 Recruit Salazar pictured in the ranks just prior to heading up the Sycuan mountain. 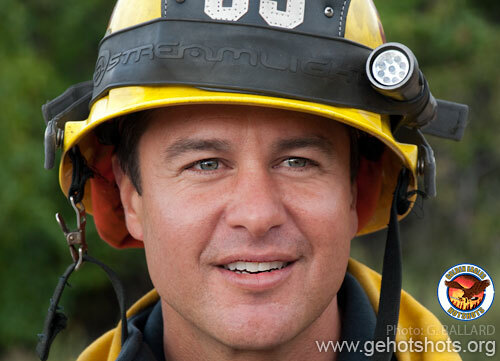 I had lost my light at this point and focused the rest of my time on video for the academy contract DVD fire movie. 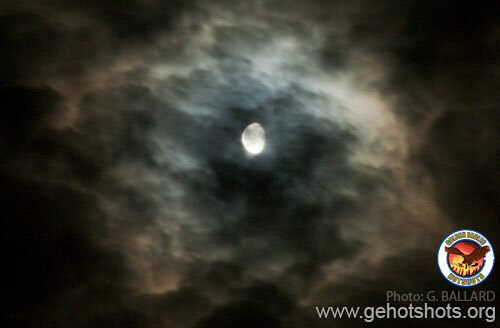 The night was partially cloudy with just over a half full moon when the photographer arrived at scene, 0400 hours. 0400 HOURS  Here's where I found the academy at 0400 hrs  hunkered down atop MF Mountain after cutting line all night. 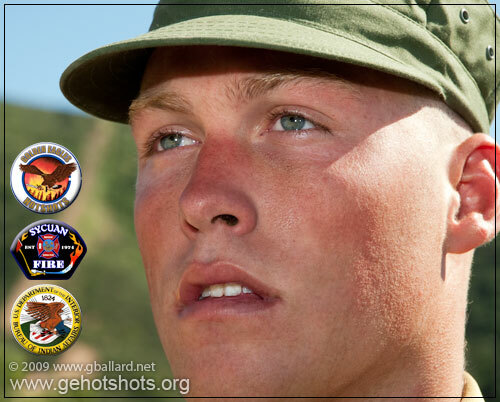 DOWNLOAD HIGH-RESOLUTION BIA POSTER for more information about this professional picture. DI Bowen trained all night with the recruits and is pictured here on the edge of MF Mountain taking in the view of the beautiful Dehesa Valley below just prior to sunrise. The remote mountain top was quite chilly and the smart recruits snuggled together to keep warm in the damp morning air and sweaty clothing. 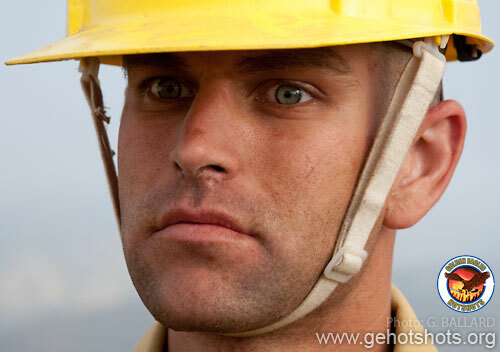 The hard night shows in the young firemen faces. 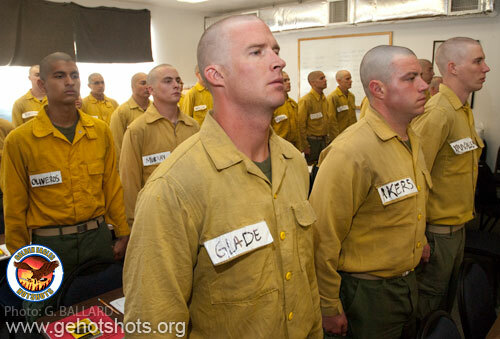 Fire faces stressed exhaustion photographs  the young men are well on their way to becoming elite professional wildland firefighters. WILDLAND RECRUITS PHOTO SCRAPBOOK  Sycuan Academy #12 poses for an early morning group picture after night one of coyote tactics. DOWNLOAD HIGH REZ PHOTO. 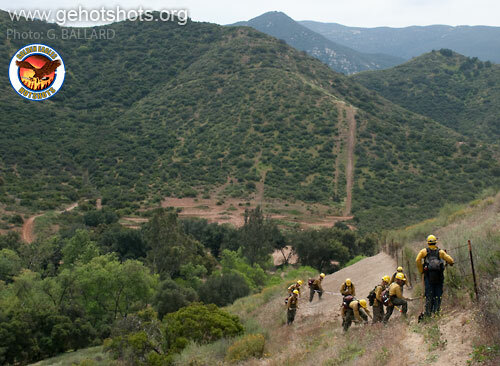 Wildland crew hikes back down MF Mountain and on to their new job site to continue their second day of Night Operations at their new assignment on the other side of the Sycuan Indian Reservation. Special thanks to Supt. Mendez who 4-wheeled his customized Toyota up and down the dilapidated Sycuan switchback to transport the photo gear and crew supplies  Juan made this treacherous drive with me at 0400 hours in the black of night. 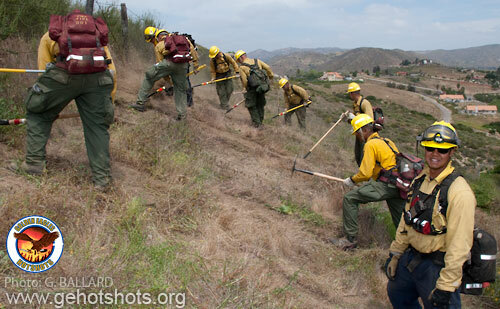 The fire crews arrived at scene on the Sycuan land and began clearing a wide fire line in preparation for the 2009 fire season in East County San Diego. 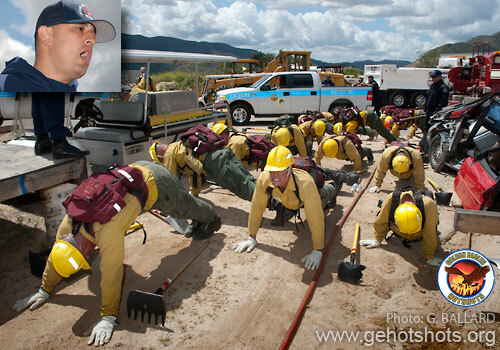 It helps to have a big voice on the fire line  GE IHC Firefighter Delarosa, a graduate of the 2008 Sycuan-BIA Fire Academy, called out instructions to recruits. 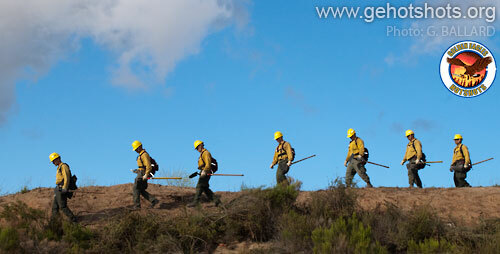 The BIA Golden Eagles interagency hotshots crew closely supervise training at Sycuan. 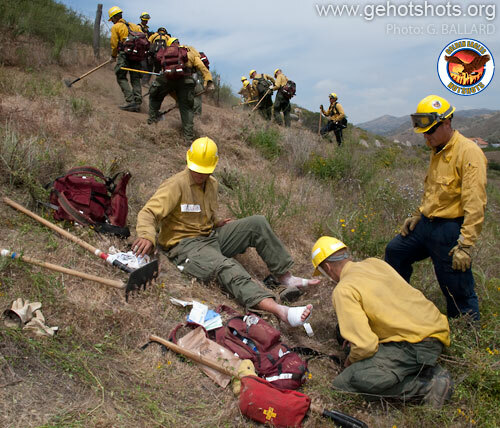 Many recruits bring valuable expertise to the federal fire programs, here a trained Sycuan medic tends to a fellow recruit's blistered feet. 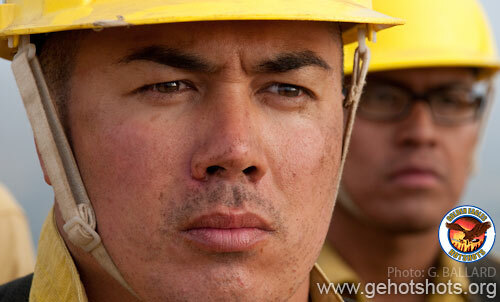 Golden Eagles Firefighter Chea (looking at the photographer) is a successful fire academy graduate of last year's BIA-Sycuan fire academy. Note: The recruits worked on this line through today and are expected to finish it up tomorrow morning working throughout the night (again). 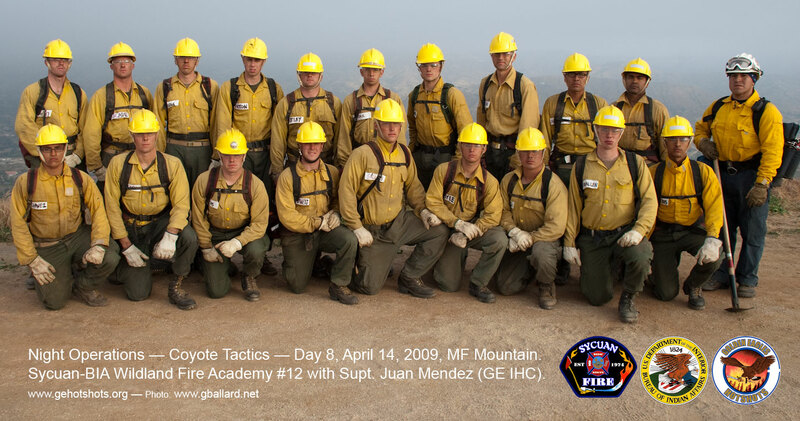 Heagney and his fellow recruits wrapped up 36 continuous hours of extremely demanding Night Operations (Coyote Tactics) cutting fire lines on the Sycuan mountains  all 19 remaining students who began the operation successfully finished it  above photo taken April 15th, 0630 hours. 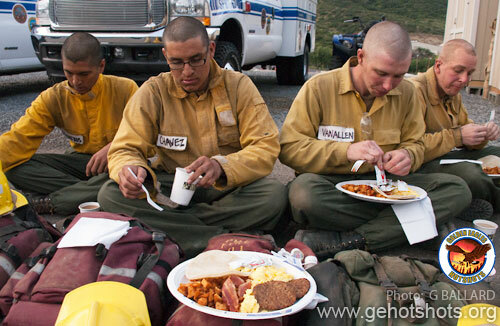 The recruits finished up Coyote Tactics and got some hot food in the Golden Eagles Base Camp. Fighterfighter morale was pretty high during the morning  I think they are glad Night Ops is over and that everyone made it. 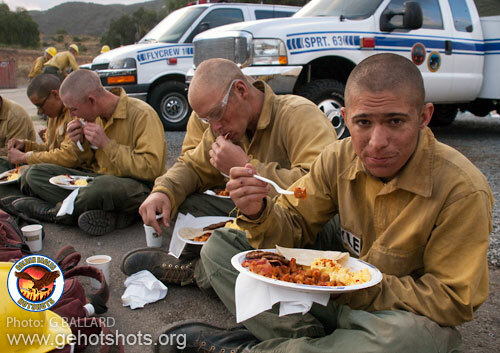 The recruits got a real taste of the wildland lifestyle in this operation. 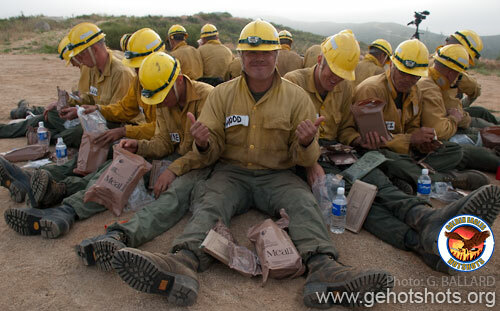 The successful fire students got all they could eat and it even looks like they got hot coffee to reward their outstanding work over the past two days and two nights on the mountain. 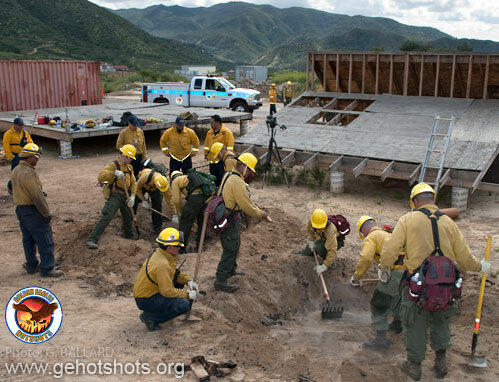 HOTSHOTS "IN THE REAL WORLD"  DOWNLOAD HIGH-RESOLUTION POSTER (you will want to zoom in on this one), featuring a bit of firefighters' reality from Capt. 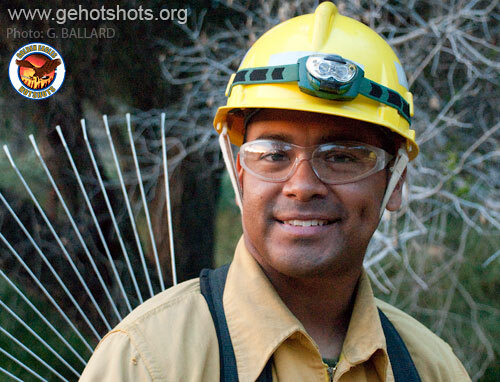 Alcantara's professional fireman's scrapbook  Spiked Out Nine Consecutive Days (West Basin Complex, 2008). TOO CLOSE, Day 11  A sharp-eyed Sycuan instructor, Captain Warren Hopkins, spotted this large San Diego rattlesnake as a student was about to step beside it during a hectic hose lay up a badly eroded steep Sycuan mountain trail. 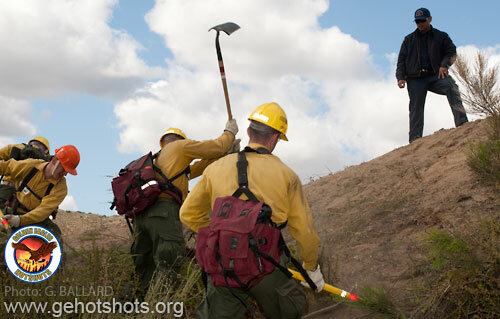 Wildland experts believe the snake had been lying dormant in a deep rut in the trail and the flood of hose water forced it to flee its hiding place for safety  luckily the day was a bit chilly and the highly-venomous snake wasn't nasty  it did not even shake and rattle its tail as a warning or strike at the fire fighters during the entire capture-release process. Sycuan staff Firefighter Fred Jaks was able to capture the snake, release it unharmed away from the training area and resume training. My still camera was halfway up the mountain so I only got the initial photo sequence on video, but below I posted a sharp, high-resolution BIA safety-training poster of firefighter holding the giant rattlesnake. 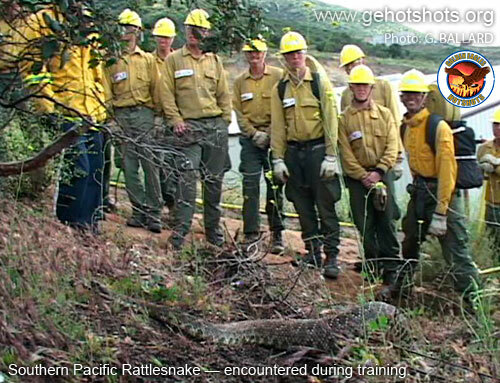 Sycuan Fire Fighter Fred Jaks  www.firehousedragons.com  removed the poisonous southern Pacific rattlesnake from the training area. DOWNLOAD HIGH-RESOLUTION SNAKE PHOTO. Common names for the southern Pacific rattlesnake, include black diamond rattlesnake, black (diamond) rattler, gray diamond back, mountain rattler, Pacific rattler, San Diegan rattler, timber rattler  in any case is is best to avoid contact with these dangerous animals. 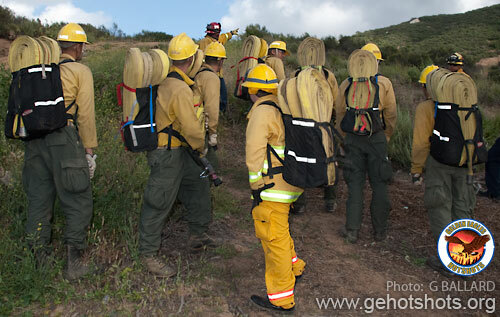 Fire-fighting students with heavy hose packs on their backs listened up to Captain Hopkins went over the plan just before they raced up the mountain laying hose  the young man in the center with the fresh yellow uniform was a visiting Explorer, La Mesa Fire Dept. 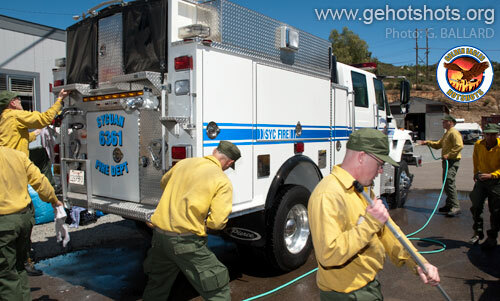 The recruits drained, cleaned and repacked the fire hoses after each hose lay. 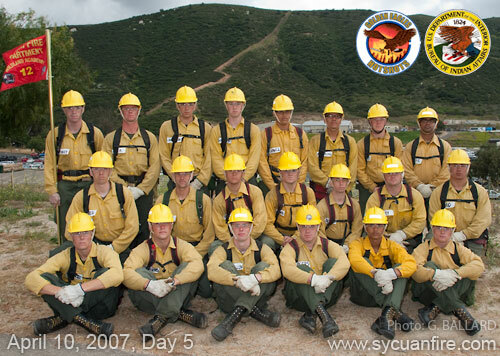 These are the tough fire-fighter faces of the young men as they participated in the challenging Sycuan fire training during hose lays up MF on Day Eleven, 1600 hrs. It must have seemed surreal at the time the recruits stumbled up the mountain and encountered the huge rattle snake  coming off 52 hours of Night Operations, the hardest work imaginable cutting line for those two days and nights on the mountain, and now following through with dragging heavy fire hoses up and down the mountain. 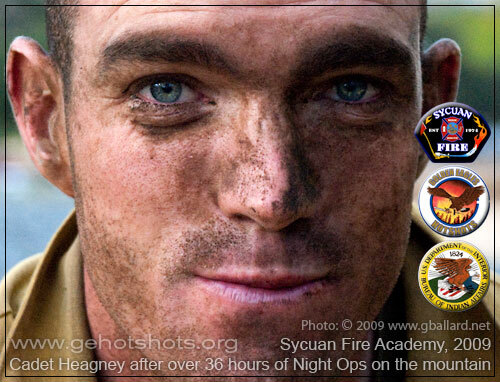 Sleep deprivation  pushing the men well past their preconceived limits of physical and mental stamina are tactics used by Sycuan and the military in the most elite special forces. 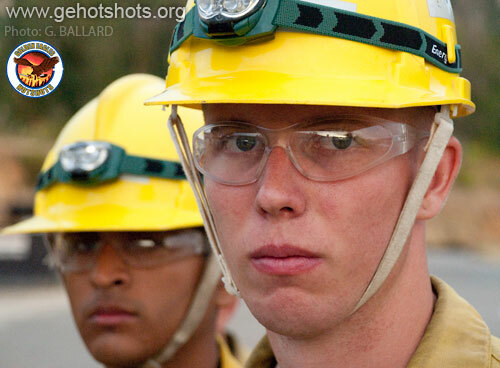 Wildland firefighters must be tough and hard as nails in stressful situations  only the best, most-determined cadets can finish the challenging three-week wildland training program. 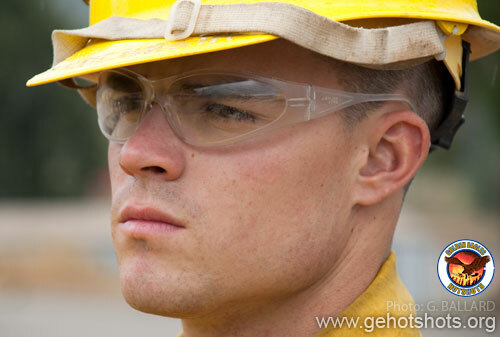 Sycuan Fire Fighter Nick Carlson (Yurok) assisted training. 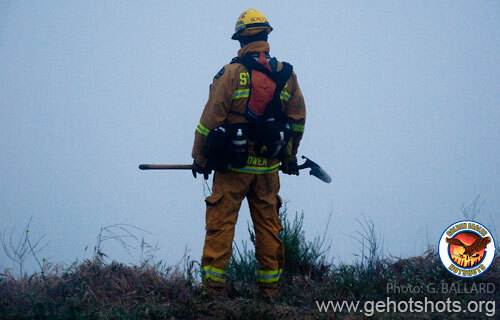 Sycuan Fire Fighter Howie assisted training. HEADQUARTERS ADMIN  DI Solis (SFD), Captain Alcantara (GE IHC), and Captain Rick Madrigal (GE IHC) observe the recruits fall in for chow. 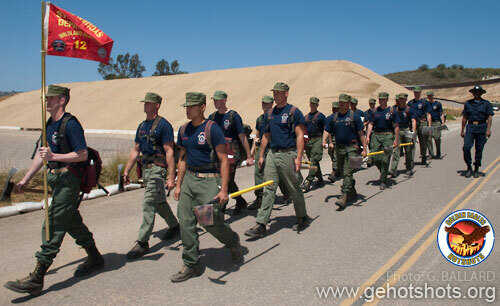 Cadets march to their next assignment  a simulated disaster training event sponsored by the Tribal Emergency Response Commission  still the recruits aren't all stepping together yet. 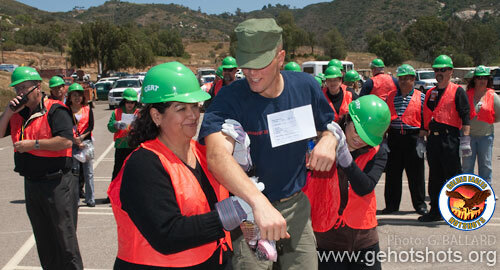 Sycuan reservation CERT participants (in green helmets and orange safety vests) pulled the recruits out of a simulated rollover accident of a bus  above two female disaster specialists help a "lightly injured, disoriented" recruit walk to a pre-designated safe area. 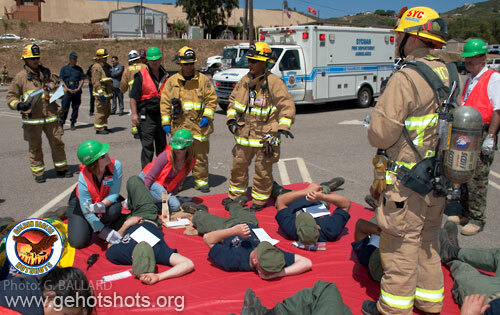 SYCUAN SERVING THE SAN DIEGO EAST COUNTY COMMUNITY: A continuing education program with the San Diego Fire-Rescue Department SDFD CERT San Diego  Sycuan tribal-casino-police-fire personnel and local first responders practice working together to train and empower citizens in safe, effective neighborhood CERT teams in Dehesa Valley. 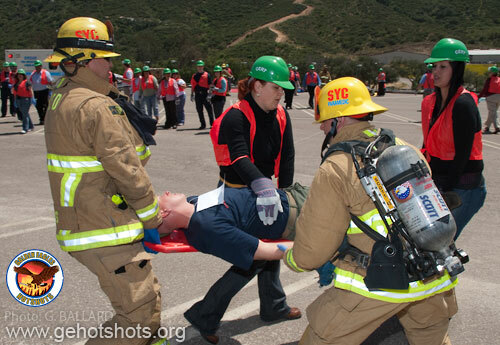 Sycuan first responders are assisted by Sycuan tribal CERT participants carrying an injured recruit on an emergency stretcher. The plan listed six fatalities and injuries ranged from minor to very serious life threatening  each recruit had a note pinned on his shirt with notes about his injuries sustained in the crash. 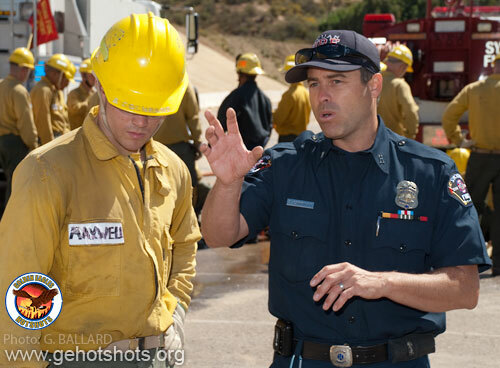 SYFD Battalion Chief Robert Nelson (right) discusses the training coordination with a casino executive and two tribal police officers. 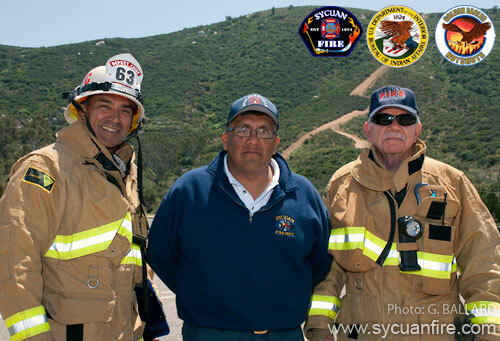 SYCUAN FIRE CHIEFS  Deputy Chief Villalpando, Battalion Chief Kanseah (Mescalero-Apache) of the Sycuan Fire Department Wildland Division, and Division Chief Bill Clayton posed for a picture just prior to the training exercise. 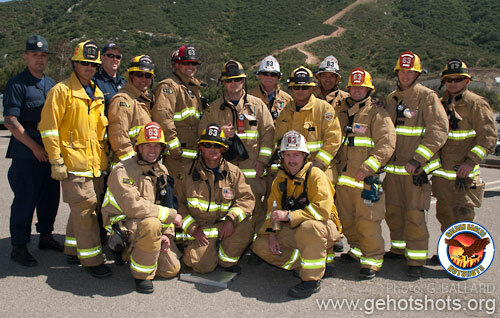 Some of the Sycuan fire staff posed for a group photo after the exercise  DOWNLOAD HIGH-REZ San Diego professional fire fighters poster. Hi Baby! We're all so proud of you for following your dreams! Keep up the good work. We can't wait to see you. We all love you so much! BIA Captain Byron Alcantara, GE IHC, was giving a lecture this morning about chain saws to the remaining 18 recruits when I arrived at noon today. 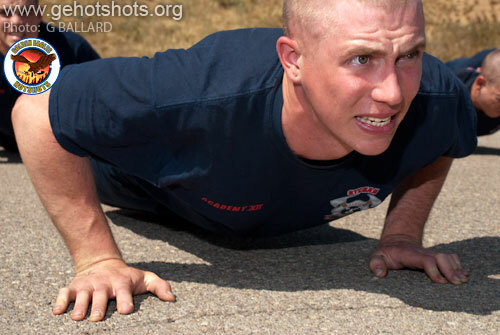 Even the best fire academy pictures do not do justice to how physically demanding and relenting the Sycuan fire academy training is  here a recruit holds a pushup inches off the ground in great athletic form and looks at the instructor for the order to push up (or finish the rep). 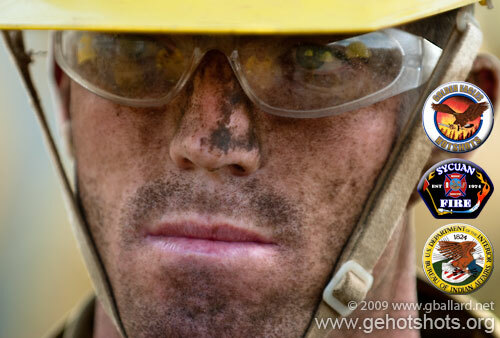 The heat returned to the high desert mountains today and the grinder was a broiling oven baking the cadets from the hot asphalt below and bearing down on them from the hot Southern California sun above. 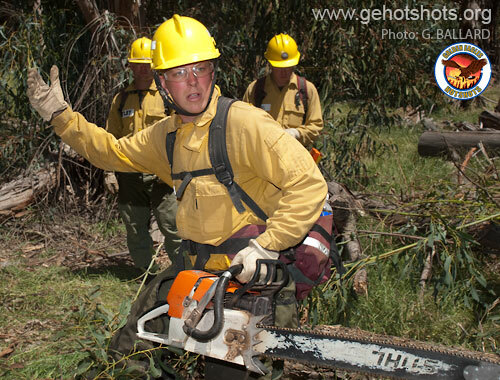 BIA Firefighter Fred Sawboss (right) trained and observed the Bureau of Indian Affairs fire students as they got some valuable hands-on training cutting trees with real fire-fighting chainsaws. 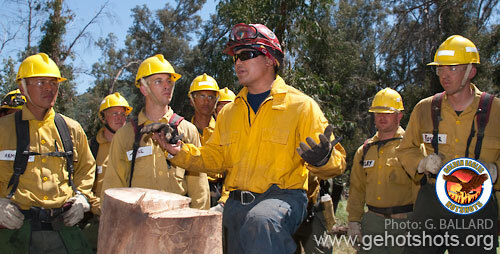 The fire academy students took turns running the saws. 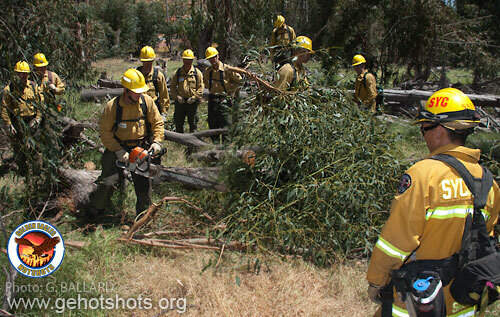 An Iipay (Northern Kumeyaay-Diegueño) Native American fire fighter from San Pasqual Indian Reservation talked to the San Diego County fire-fighting students during a field class about cutting down a tree with a chainsaw. 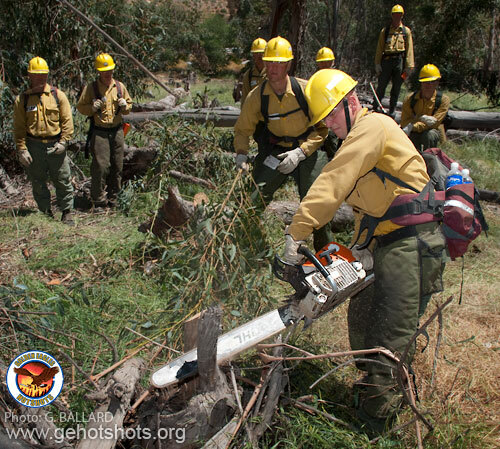 Fire Captain Alcantara of the Golden Eagles Hotshots, Sycuan Fire Department, ran the Field Practicum today and is pictured at a fresh cut explaining about how the GE Hotshots professional sawyers cut trees down. 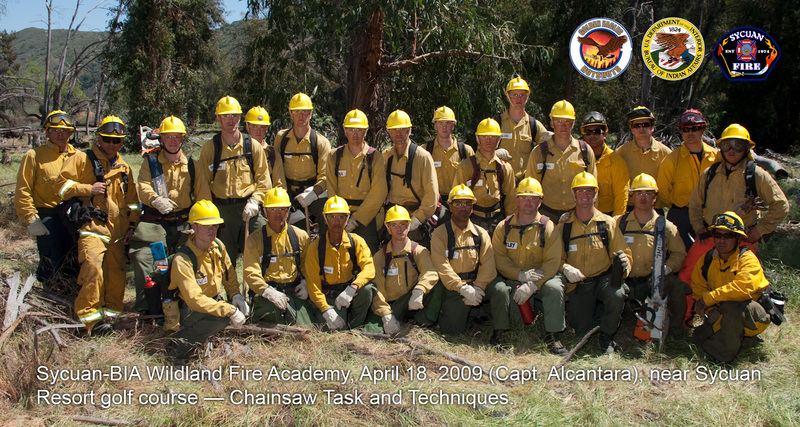 BIA and Sycuan firefighters, academy recruits and two visiting Iipay firemen from San Pasqual Fire Department posed for scrapbook group photo after their class about chainsaws. 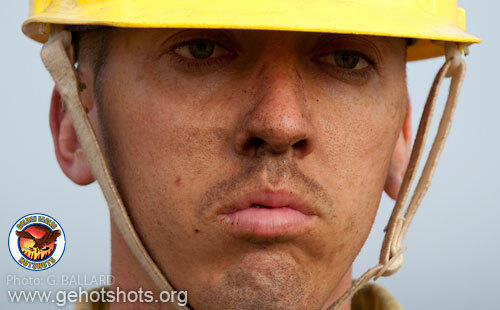 DOWNLOAD HIGH RESOLUTION photo for fire-fighter gallery photo albums. This morning the recruits were in the classroom attending an Introduction to CPR class held by a professional female CPR instructor. The students got some hands-on experience on CPR manikins. 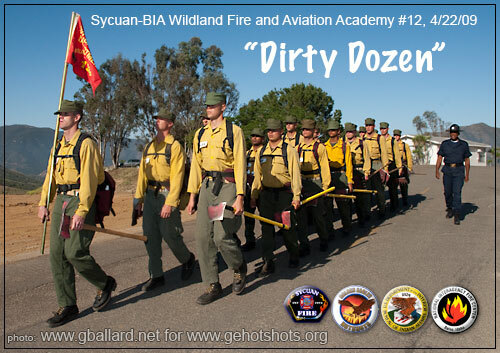 THE DIRTY DOZEN  BIA-Sycuan Fire and Aviation Academy #12 marches in formation, 0800 hours, April 22, 2009  all remaining 18 fire-fighting students are expected to be graduated Saturday at Sycuan Resort, El Cajon, CA  DOWNLOAD 10-INCH FILE. 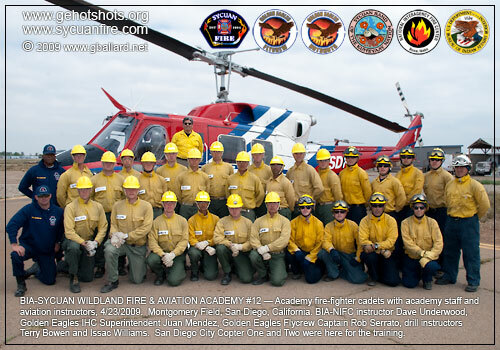 The students have been spending the last couple days in the classroom with Dave Underwood  BIA-NIFC aviation instructor gearing up for their hands-on helicopter training at Montgomery Field, San Diego. BIA-NIFC aviation training officer and highly-experienced helitack instructor Dave Underwood spent a lot of time the past several days with the students in the classroom preparing them for Sycuan helicopter operations and their professional aviation certification requirements  BUREAU OF INDIAN AFFAIRS (BIA) and the NATIONAL INTERAGENCY FIRE CENTER (NIFC) Web sites. Sunset hike up MF Mountain (three recruits not pictured)  DOWNLOAD 10-INCH HI-REZ  they came, they seized the moment. San Diego City Copter 2 flew into the classroom fast and furious at Montgomery Field and landed feet beside the BIA aviation students  City Copter 1 is parked in the background. 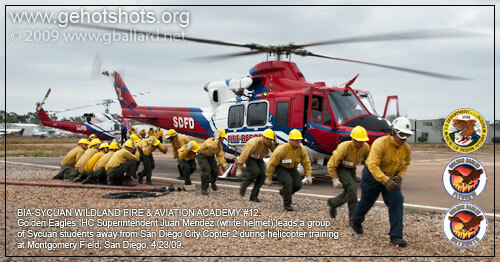 MONTGOMERY FIELD HELIBASE, SAN DIEGO  Chief Kanseah leads a squad of Sycuan aviation students away from San Diego City Copter 2  DOWNLOAD 10-INCH SCRAPBOOK PICTURE. 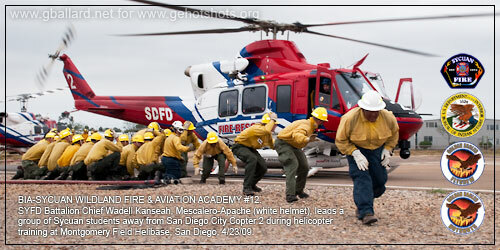 The academy got some hands-on experience working around and inside the San Diego fire helicopters, including sling loads. 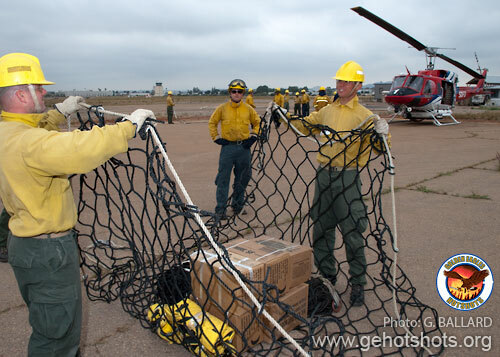 The experienced Sycuan Golden Eagles Flycrew members assisted with training, students practice sling loads. Passing along knowledge  getting the students to think about what they are learning  is one of the primary goals of the academy, Supt. 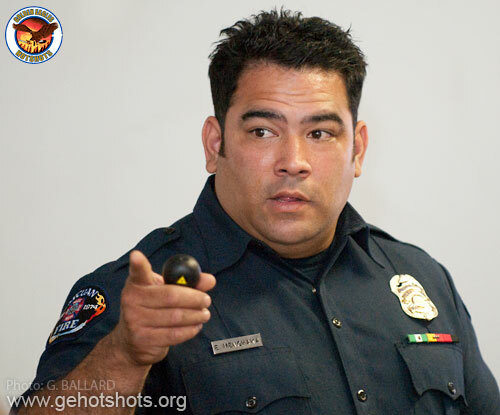 Mendez makes an important point to students during training. San Diego fire-fighting students posed for professional photo with their BIA-NIFC aviation instructor, Golden Eagles Flycrew instructors, and drill instructors  DOWNLOAD 10-INCH FILE. The academy had a final inspection just after sunset. A Sycuan student demonstrates helicopter hand signals for Battalion Chief Kanseah (Mescalero-Apache) and DI Solis  students were quizzed on a variety of academy material. These are the faces of successful young men. Hey, boys! You have BECOME MEN right in front of my FACE during YOUR three weeks of BOOT CAMP! I'm in AWE of your ENDURANCE, DETERMINATION, and DISCIPLINE. 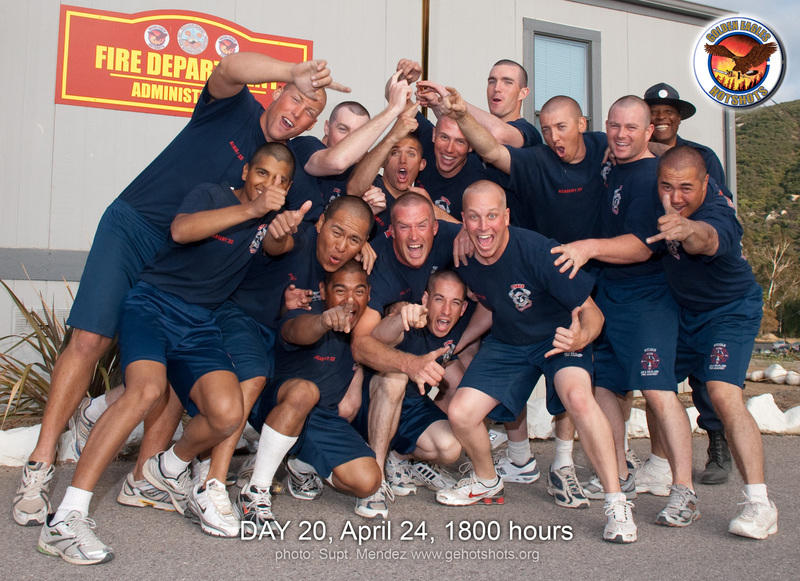 Your STAMINA and DESIRE speak volumes about who you have become as a TEAM  18 GRADS  2009! SUPT Mendez took this great academy photograph at sunset after the men had just flipped tires and ran hose lays  hot pizza was delivered and waiting  they are definitely a team and strong. 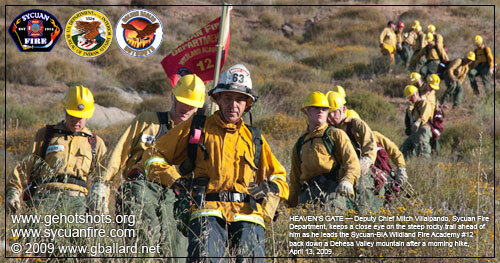 DOWNLOAD 10-INCH PHOTO for firemen's scrapbook. Graduation is tomorrow, hope you can make it  photos will be posted. 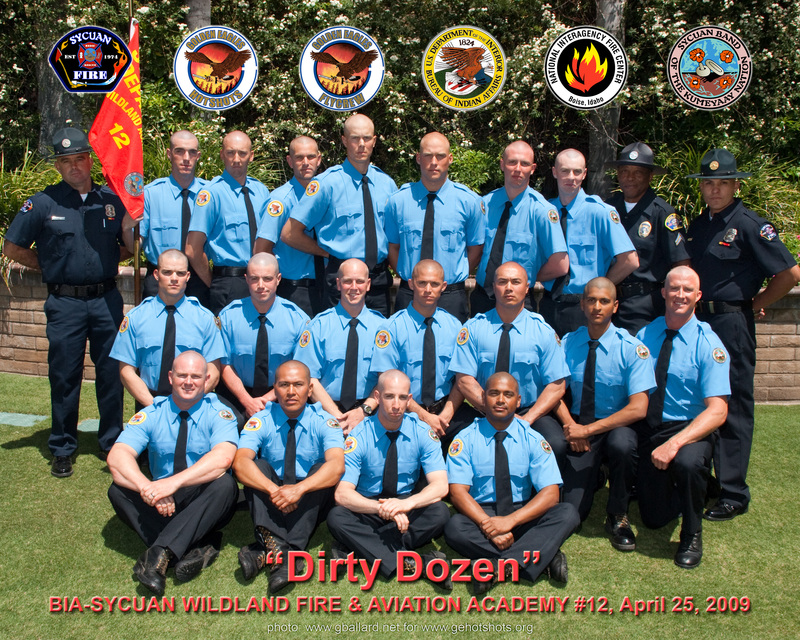 The "Dirty Dozen"  18 recruits  were successfully graduated from the Sycuan-BIA Wildland Fire and Aviation Academy, April 25, 2009  DOWNLOAD 10-INCH PHOTO. 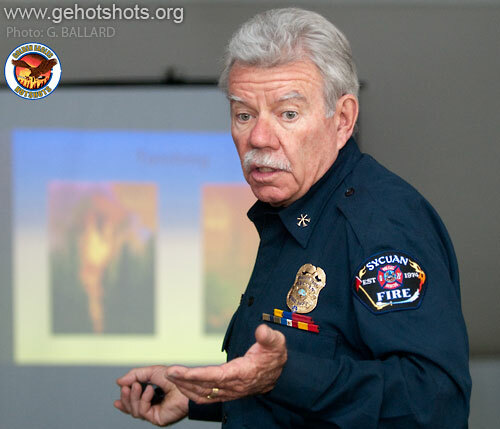 The Sycuan Resort was packed for the viewing of the multimedia presentation  a fire-fighting academy documentary movie by Gary G. Ballard  the final DVD will be released in the next month or two  WATCH ALL SYCUAN FIRE MOVIES FREE ONLINE. 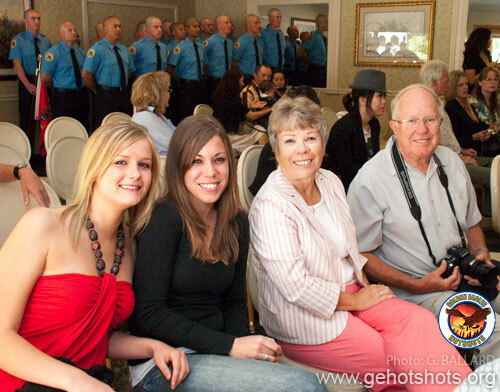 Fire-fighter family picture with pretty young girls, girlfriends, sisters, mothers. 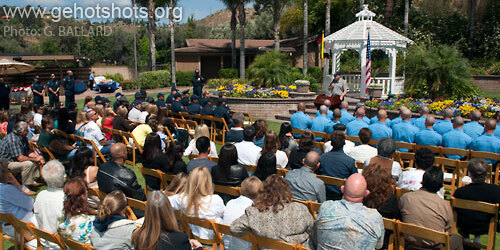 The graduation ceremony took place outside in the beautiful Sycuan Resort, formally Singing Hills Country Club. 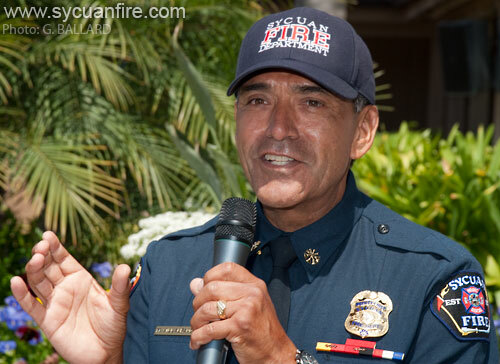 Sycuan Fire Department Deputy Chief Villalpando addressed the recruits, families and Sycuan staff. 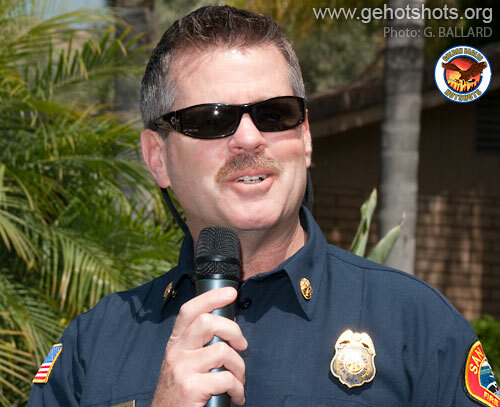 Deputy Chief Brian Fennessy, special operations officer of San Diego City Fire and Rescue fire department, addressed the recruits and the importance of family support. BIA Regional Fire Management Officer Ron Recker also gave the recruits and families insight into the fire-fighting profession  Fire-Fighter Recker has decades in the fire service and spoke at length about his personal experiences, including how firemen worked in the old days before cell phones, satellite communications, computers and the Internet. Sycuan crew officers stood by and paid attention to the valuable advice and interesting comments made by their superiors. 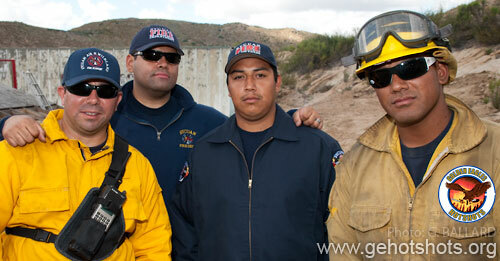 Pictured (l-r) Captain Jose "DZAW" Deza (Golden Eagles Fuels Crew), Capt. Byron "B Ron" Alcantara (Golden Eagles IHC), Captain Rick "Mad" Madrigal (Golden Eagles IHC), Superintendent Juan "Huge" Mendez (Golden Eagles IHC), Captain Clark "Rob" Serrato (Golden Eagles Flycrew)  DOWNLOAD FULL RESOLUTION PHOTO. 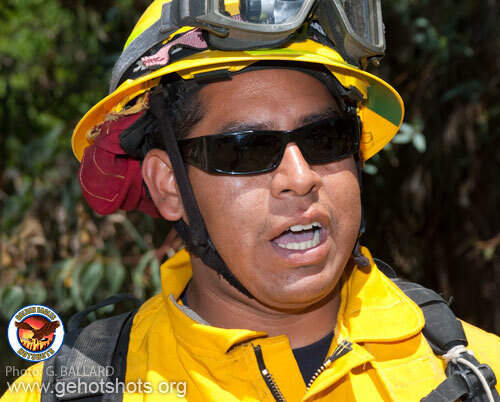 Sycuan Fire Department Wildland Division Battalion Chief Wadell Kanseah (Mescalero-Apache) gave the audience the benefit of his professional insight and best wishes for successful fire careers. 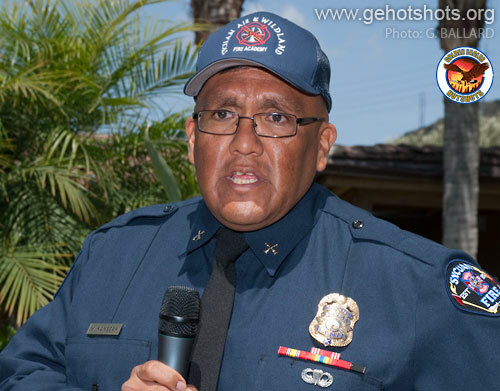 Sycuan tribal member Hank Murphy: Chief and founder of the Sycuan Fire Department, addressed the recruits and their families, thanked the academy staff, and declared the recruits "Fire Fighters." The recruits  now officially certified "Fire Fighters"  received their academy certificates directly from Chief Murphy. 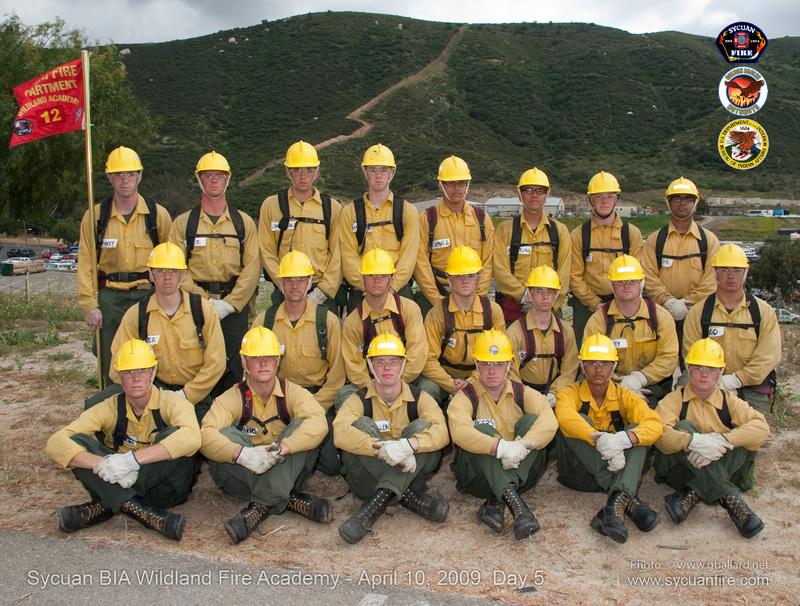 HERE is a professional blog on the first wildland deployment for the 2007 academy class fire season, including Mohawk haircuts (a Sycuan fire-fighting tradition. 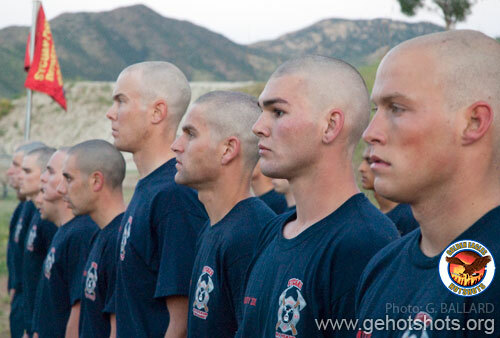 The rookie firefighters can cut their Mohawks only after their first fire). Chief Murphy presented the awards, then Chief Villalpando and Laurie Bell congratulated the new fire fighters. 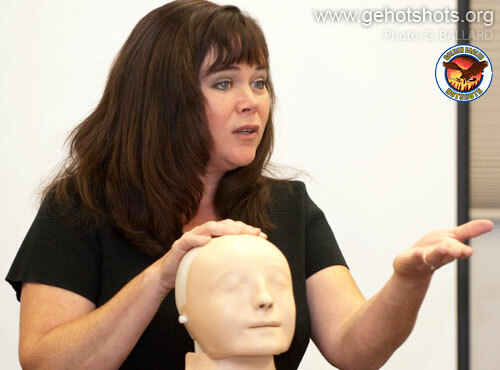 Laurie, a retired U.S. Navy chief petty officer, is the office manager for the SYFD and the academy. 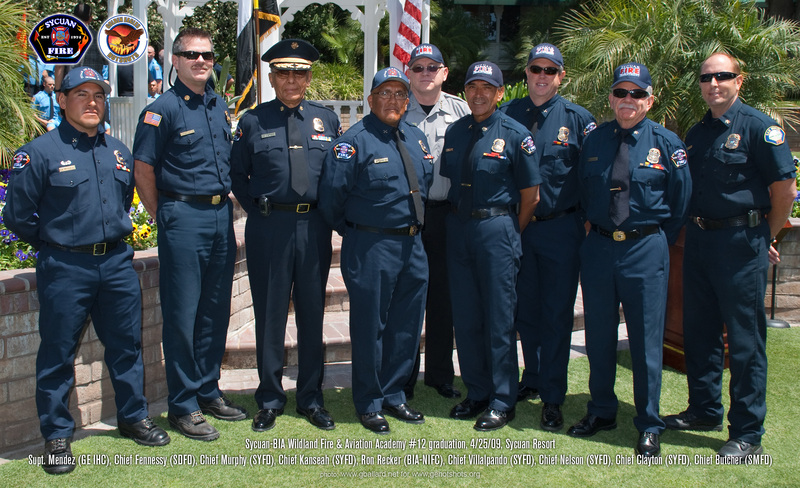 "Chief Murphy  Thank you for this incredible opportunity  A special thanks to Chief Villalpando, Division Chief Clayton, Battalion Chief Kanseah and the entire staff of SYFD"
THANK YOU  The "Dirty Dozen" thanked the academy staff and presented Sycuan Chief Hank Murphy with a special plaque. 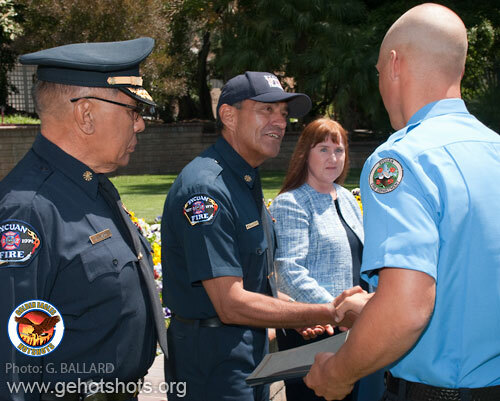 DI Jorge Solis, a Sycuan fire fighter, handed out special awards to several outstanding recruits and then he officially dismissed the newly-graduated firefighters from the academy. 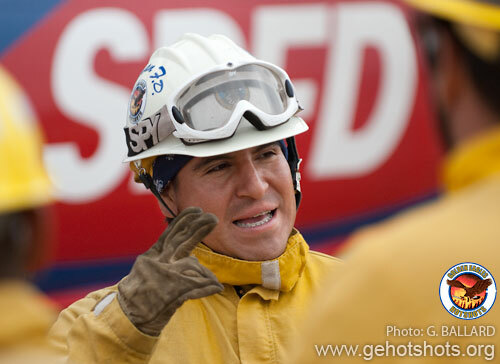 DI Solis pictured congratulating the firemen directly after he dismissed them from the academy  you may notice Sycuan Firefighter Jorge Solis took off his game face and returned to his normal happy self. This was a big day in the successful students' lives and many of their family members traveled to witness the historic family event. 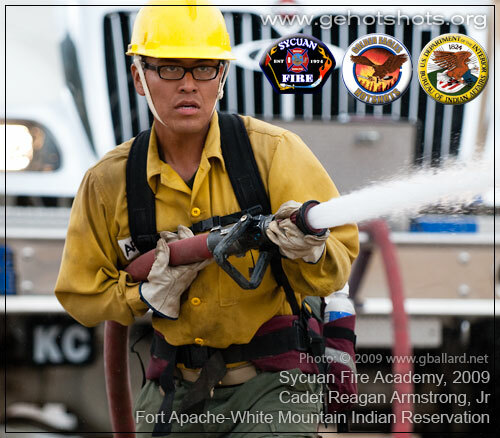 NATIVE PRIDE  The Sycuan Tribal Fire Department encourages American Indian men and women to apply to the Sycuan academy program. 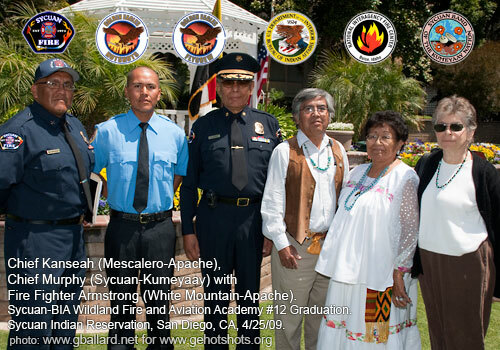 Pictured above are two Sycuan chiefs with FireFighter Armstrong (Apache) posing with his father, Reagan Armstrong, Sr. and family members. The group traveled down to San Diego from the Fort Apache-White Mountain Indian Reservation to see their son graduate. 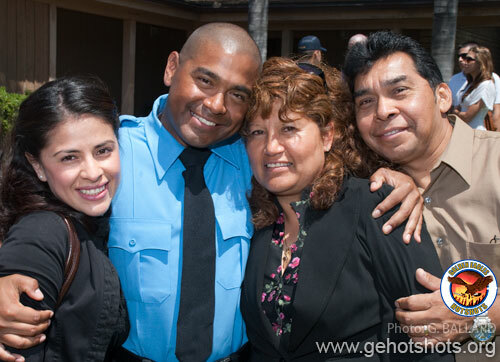 A close firefighter's family pose for a scrapbook family album picture. 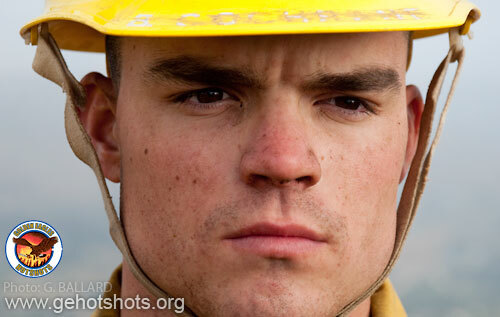 Many top famous firefighters lined up for a photo  DOWNLOAD HI-REZ 10-INCH of the Big Chiefs. 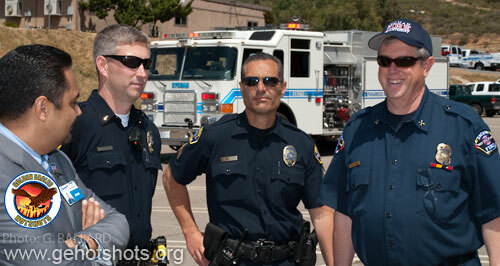 Pictured (l-r): Supt. Mendez GE IHC, Chief Fennessy SDFD, Chief Murphy SYFD, Chief Kanseah SYFD, Ron Recker BIA-NIFC, Chief Villalpando SYFD, Chief Nelson SYFD, Chief Butcher SMFD. PROFESSIONAL WEB BLOGS by G. BALLARD. ALL PHOTOS COPYRIGHT 2009 GARY G. BALLARD  ALL RIGHTS RESERVED. 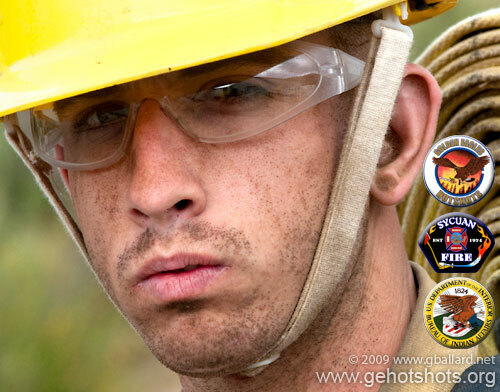 How to become a professional firefighter  view current on-line job listings  research seasonal hiring patterns within the federal, state, local, tribal fire service. 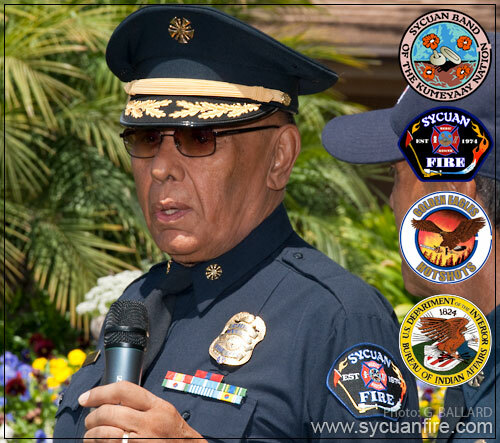 Sycuan tribal government currently employs more than 2,500 people, including well-paying positions with the Sycuan Resort and Casino, Sycuan golf resort, Sycuan Medical and Dental Clinics, Sycuan Construction, Sycuan Tribal Police Department, and the Kumeyaay Education Department. Please CONTACT WEBMASTER to edit or add photos or information.